Now after a very, very long hiatus we got back to our SkirmishCampaigns Grossdeutschland at Kursk campaign earlier this month. Now this was the 9th game over all or in other words the panultimate one in the book. It was named Steel Confrontation and honestly, it lived up to its name. The terrain was mostly open, with the a few hills and even fewer light woods. And that was it. there was the option for dust clouds to drift across the table, but only one materialized right at the beginning of the game and virtually lingered where it had started due to some very low dice rolling. If you see a row of dust markers on the table in some photos… that is it. The Germans (played by me) had two Marder III (I substituted one with a Marder II), PzKw III, PzKW IV and PzKw VI “Tiger” each. There was a 5cm Pak towed by truck and and a small infantry Platoon HQ in a Kübelwagen. The Soviets (played by Alexander) on the other hand had three units of three T34´s, one unit of three T-70´s one lone command T34 and a motorized Rifle Squad to field. 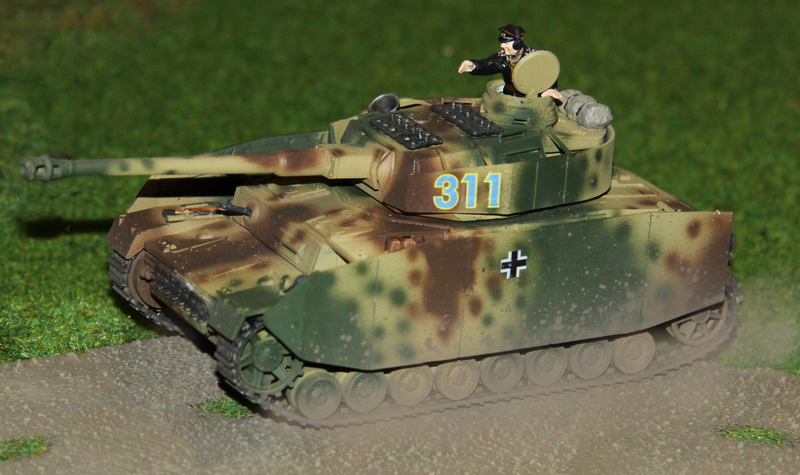 The Panzer III and command T34 would enter on a randomly determined round between round one and four. In case of the Germans this meant right from the beginning of the game and in case of the Soviets round four. Entry was also random as well. In case of the Germans this could either be the South-West corner or via a small section of the western board edge, in case of the Soviets either the North-West corner or a small patch on the eastern board edge. Now the Bolsheviks all rolled the eastern edge (how appropriate) which made that little stretch of the table look like a car park at the beginning of the game. With the Germans the Marder and PzKw III entered via the table edge and all the rest via the corner. Victory conditions for the Germans were to have both Tiger tanks operational on the southern third of the table, the Russians either had to destroy, immobilize or push them of the table. The game would run for twelve turns at most, by which time either one of the sides would have had to accomplish their goal. Now the battle turned into a swirling mass of tanks, just like some of the real tank battles during Kursk and writing this up, I felt it was nearly impossible to do a coherent report that would give a real good idea of the battle. So I am trying to do this by following the German units through the battle, because frankly… with all those T34´s I lost track of which of them did what and when. So lets start with the PzKw III. They decided to push through the dust cloud and along the western board edge to try to outflank the Soviets. The Russians did their best to prevent them from doing so and dispatched three T34´s and two T70´s to intercept them. All their other units were heading towards the southern edge of the table. Since the Panzer saw their best chance for survival in speed, they chose not to fire at their interceptors, since they were going at high speeds as well and this would have made hits highly unlikely. The lead tank did manage to get a shot off into the rear of one of the T34s who were heading South but only caused minor damage. The other PzKW III hit one of the other T-34s heading South in the flank and set off its fuel. 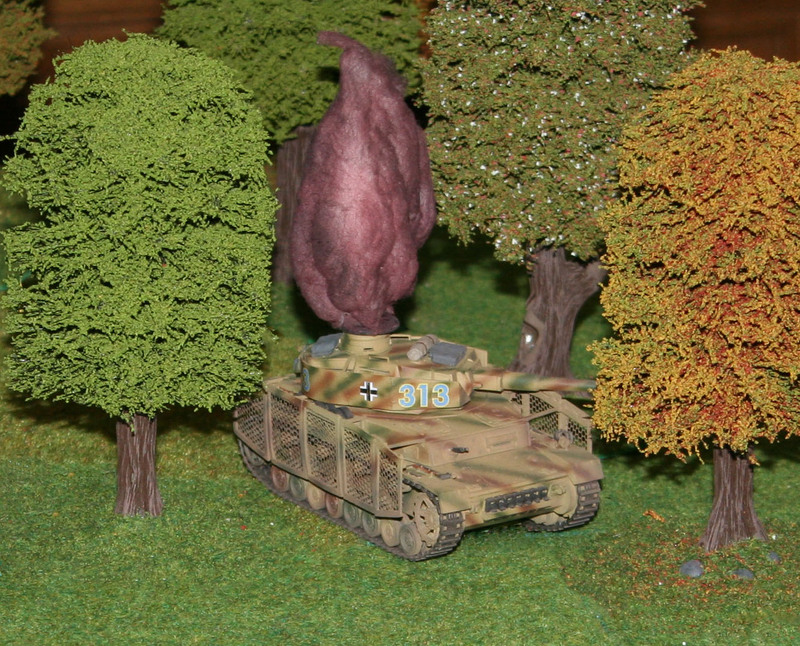 Unfortunately, shortly afterwards the lead Panzer III was taken out while moving through the woods. So his compatriot had to steer to the side not to crash into the wreck and had for a short moment to turn its rear towards its interceptors, two of which stopped and killed it with shots into his weak rear. Now the PzKw IV lead quiet an uneventful life. One of them decided to take its chances and fired its main gun at the approaching T34´s even though both were going at full speed. Chances for a hit were extremely low, but still it struck gold on its first shot and managed to explode the ammo in the T34 it had fired upon. But its next few shots all missed and in the end it was taken out by a similar chance shot from one of the T34´s while still advancing. The other T34 managed to kill all of the crew, except for the bow machine gunner on one of the T34 (this man would move to the commanders position, but did only get to fire off a single shot before the game ended, which missed). Shortly afterwards it was taken out by a hit which exploded its ammo while scaling a hillside. The German truck towing the AT gun and the Kübelwagen had charged forward and stopped behind the ridge of a hill. The PaK with the intention to set up a firing position, the infantry trying to cover it. Before the AT crew could even unlimber the gun, they were taken under fire by the Soviet DP machine gun from the Rifle Squad which had sped forward in its own truck to the other side of the hill. None of them were injured, but the trucks engine took a number of hits. The German infantry had a hard time protecting their compatriots, since they were still getting out of their Kübelwagen and were coming under fire from the Russian riflemen. So one of the Tiger, lacking tank targets at the moment loaded HE ammo and fired at the Soviet infantry. Most of the squad went unharmed, but the DP gunner was ripped to pieces. So his mates withdrew into the cover of the hills lee side. The crew would then set up its PaK and after a short wait, managed to take out a T34 with a hit to its front. They waited patiently for further targets, but soon their field of fire was blocked by T34 wrecks and they chose not to relocate for fear of becoming a prominent target. 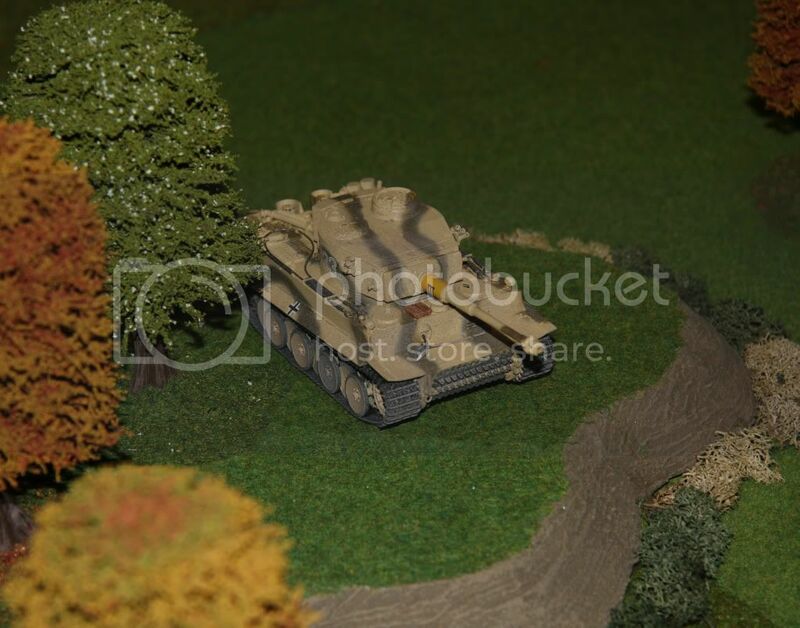 Now the Marder III moved forward a little bit before going into a hull down position behind a hill. From there it managed to score two hits on a T34, the first doing some damage, the other one setting it aflame. But soon after, its superstructure was hit and all of the crew but the driver were killed. 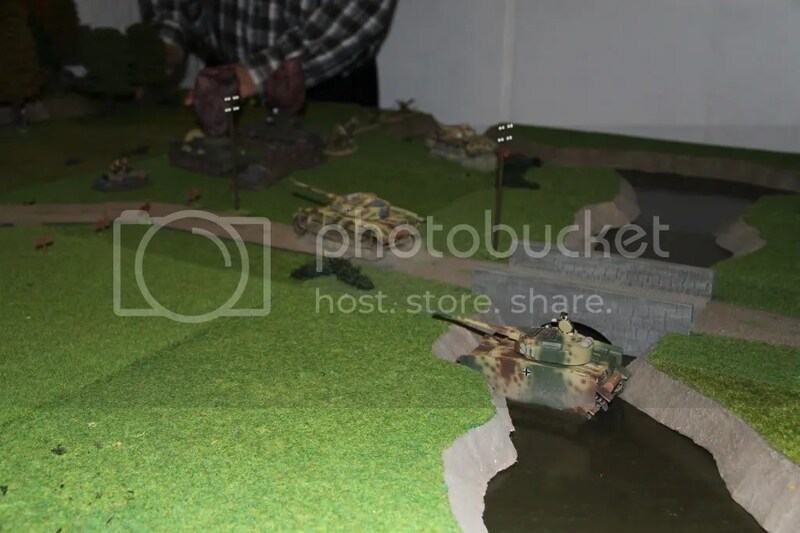 After recovering his nerves, he climbed up to the gun compartment to man it, but until the end of the game, its view was blocked by burning tanks as well. Now the other Marder led a rather eventful live. for lack of better positions, if crossed the battlefield from the West to the East, firing the odd shot without much success. One of the T34´s tried to ram it, but it evaded at the last moment. This brought it close to the Russian Infantry. So it charged into the foot soldiers dispersing them and killing two in the process. And it was gone before the Soviets recovered and tried to throw hand grenades into its open top. It would then turn back north towards towards the centre and damage one of the T34s which was then taken out by one of the Tiger tanks. It would soon end up hiding between some Russian wrecks in the centre and actually managed to destroy one of the T-34´s which had turned around from their successful Panzer III hunt. 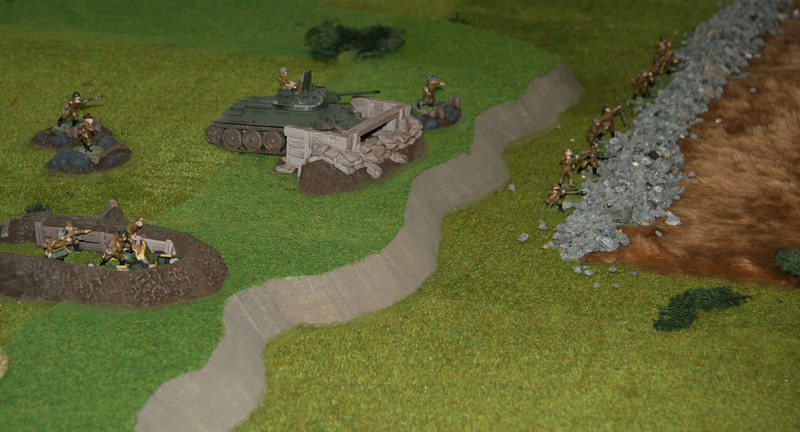 By this time the command T-34 had entered the table and seeming the Marder boxed in decided to ram it. Now that one did not turn out as the Russian commander had planned. While it did massive damage to the Marder tracks and wheels it did not render it in operational. On the other hand, it managed to smash its own main gun seriously damaging the commander. When the T34 reversed, the Marder turned and took it out, which actually was the last kill of the game. Now the Tiger tanks did what they were designed for. They went up a hill (killing some infantry in the process as mentioned before), pointed their thick armor towards the enemy and firing at targets. In the beginning this was pretty few, since most were either out of view or had been dispatched by other vehicles already. But things got better, once the Russians who had been pursuing the PzKw III turned around. In the end they had managed to take out all the T70s and whatever T34´s they could lay their Acht-Achter upon. At the same time all the Russian shots seemed to bounce off without doing much harm. There were a few interesting moments though. Since they had taken up positions close to the Russian infantry, said infantry chose to close assault them. And they actually managed to cause the only real damage, by placing grenades on the tracks, but only enough to slow one of them down. Seeing this the German infantry charged forward to defend the tanks, which they managed killing all but one, but at a high price since all but one riflemen perished while doing so. By the time they had done so, one of the T70s had charged up the hill to get into the Tigers rear. The remaining Soldat tried to close assault it as well, but failed to do any damage. But by the time the T70 was imposition to fire, the rear Tiger had turned its turret and took it out point blank. In the end, the game ended with all but one Russian tank killed and that one only had one living crew member and was immobilized. Of the Soviet infantry only one soldier had survived. On the German side the Marder II and both Tiger tanks were operational (although one slightly slower due to track damage) and the PaK team was there as well. The Marder III was badly damaged and only had one living crew me member as well. In the end it was a German victory since they still had 6 ½ rounds to move the Tiger tanks forward and there was opposition left. But the price ha been high and the result had been bloody. As promised, today I am migrating the first four games from our Grossdeutschland at Kursk campaign to this blog as well. The first was played in April 2009 (about three years ago… we are really taking too long with this! ), number 4 a little over one year ago. 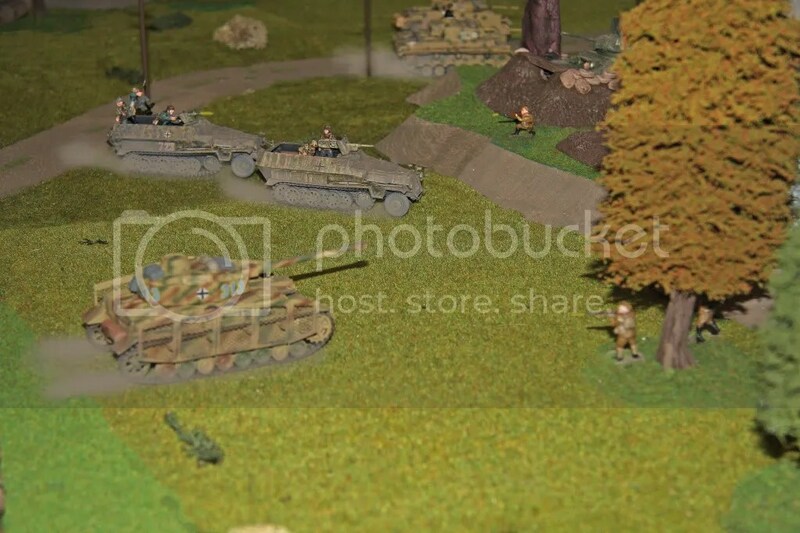 The first game is taking place on the eve of the battle of Kursk. 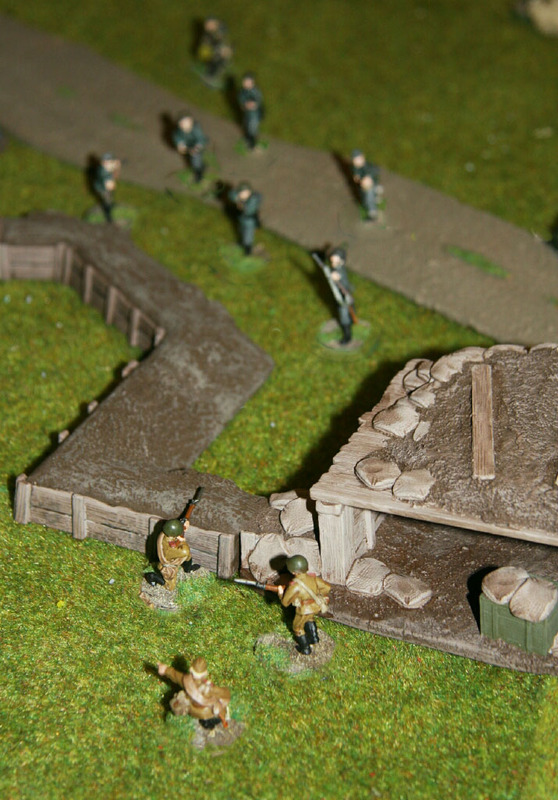 The German player has to capture or destroy a Soviet observation post and, if possible, exit the Russian side of the board with a certain amount of troops for a decisive victory. The Soviet player has to prevent this. The Terrain is relatively open. On the right hand side of the German deployment zone there is a lightly wooded hill. On the left side of the table, as well as in the middle of it there is another light wood each. In addition there is a ravine running the left hand side of the table. 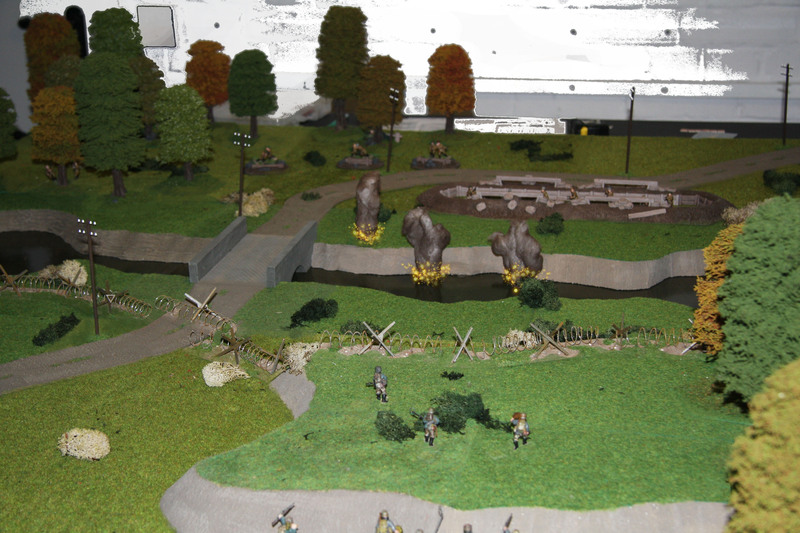 The Russian player can set up in fixed positions and foxholes. And he has some barbed wire to place (I did not get this done in time, so we used barbed wire fencing instead). 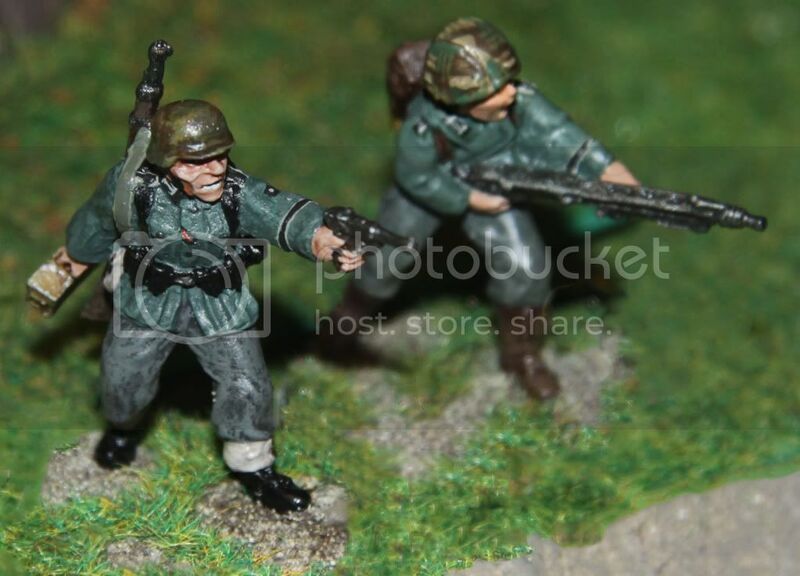 The German player had an Infantry Platoon HQ, two infantry squads (with two MG-42 each) at his disposition. In addition there was also a tri-pod mounted MG-42 team. 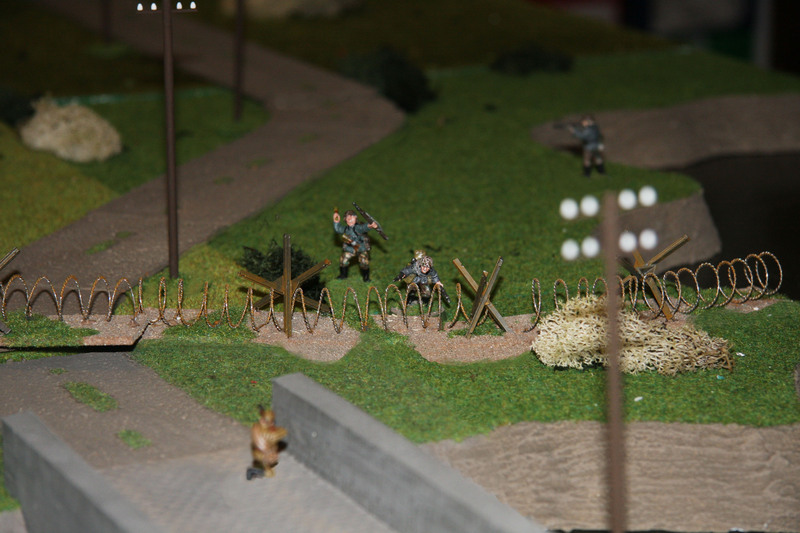 The Russian player had an observer team (setting up inside the OP), one rifle squad and a Maxim Team. In addition he received an AT-Rifle team. There were no tanks present, but its range and punch could still hurt the infantry. 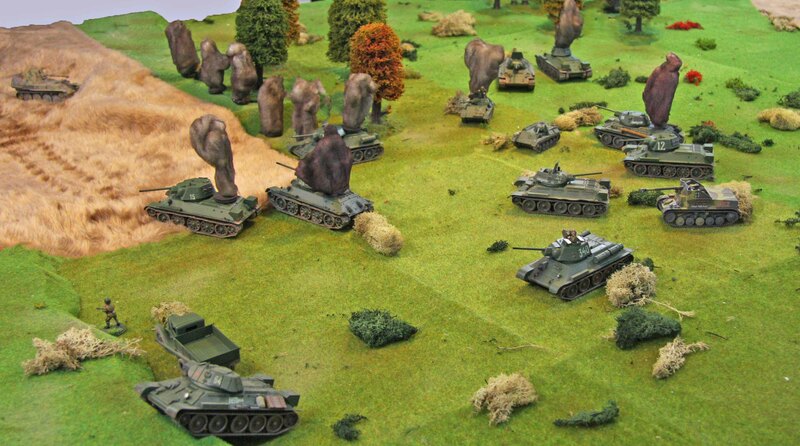 The Russian player deployed his troops in a line spanning the whole of the table. The Maxim was deployed on his right flank covering the ravine, the LMG in the centre and the AT-Rifle on his left flank. I decided to concentrate my troops on my right flank. 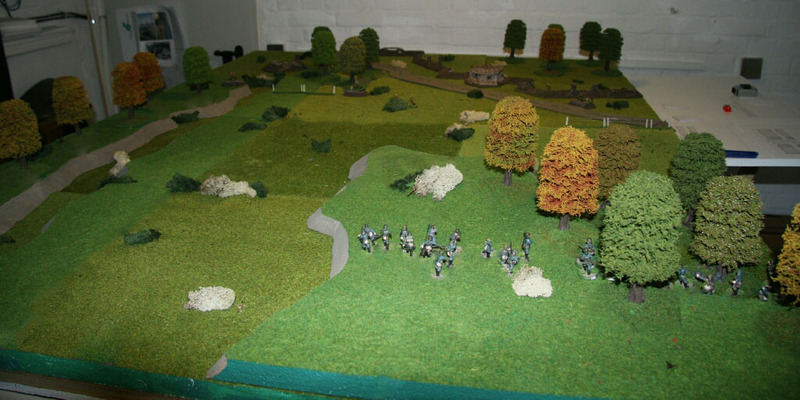 Here I was hoping to receive some cover from the hill and woods for the beginning of my advance, I could concentrate my force on one spot and my MG´s (two from the Infantry Squads and the Tri-pod mounted one) would be able to keep the Russian positions at bay from atop the hill. At least that was the plan? But there is this saying… no plan survives the first contact with the enemy. And that was the case here as well. One of the infantry machine gunners was dead, before he could even open fire. The same held true for the assistant on the other MG team, the Schütze who wanted to take his place and the NCO accompanying them. Another infantryman was so shocked by this that he was too shaken to fight on for the rest of the game. And then the Maxim and LMG opened up. While doing little physical damage, they certainly did not help German morale. At last the remaining MG-42, even if it had to fire without a feeder, and the tri-pod mounted MG-42 opened up and forced the Russian heavy weapons to cease fire. 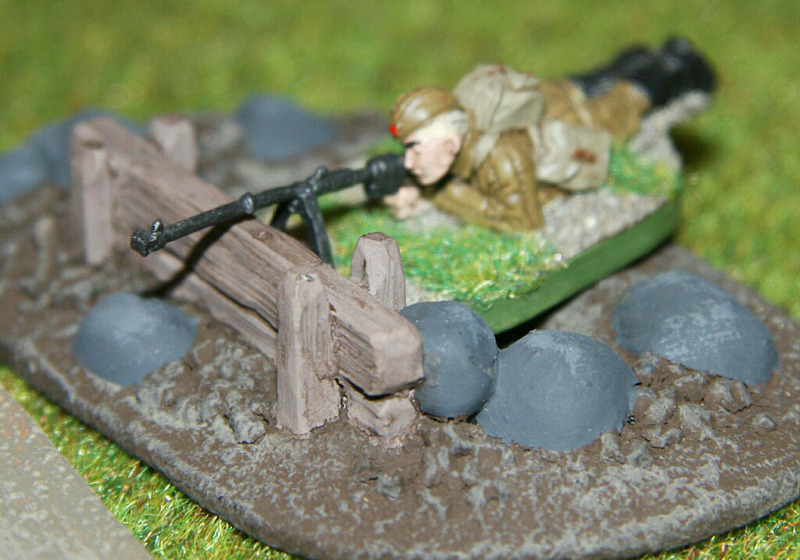 While the MG-42 on tri-pod slowly decimated the Maxim position, the remaining MG-42 fell victim to the Russian Riflemen. Now the assistant from the other MG seemed to get quite angry due to the death of his mates and started picking off the Russian infantry on the left flank, something he managed to complete until the end of the game with a little help from another Schütze. 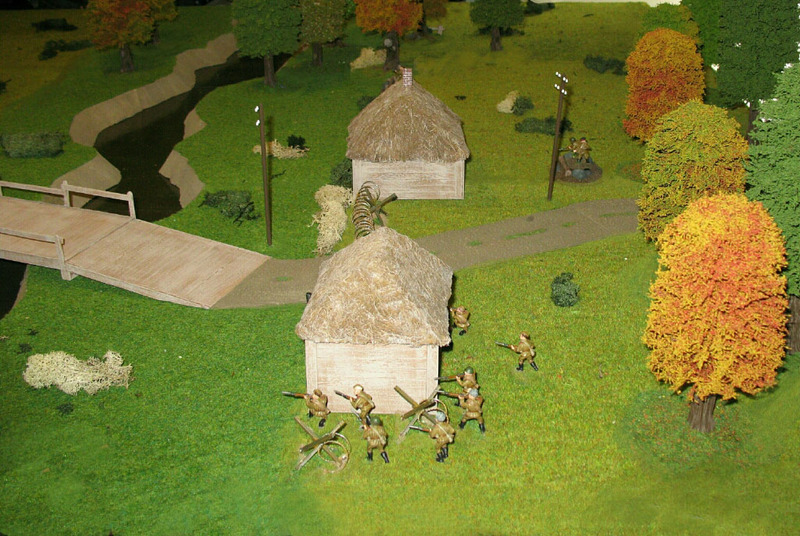 The MG-42 HMG kept the Russian positions at bay until the end of the game. Things did not go any better on the other flank either. Right at the start one of the NCO´s fell victim to the AT-Rifle and the Russian infantry were taking a steady toll on the advancing Germans. And most of the deadly shots found the NCO´s. The two MG-42´s on that flank gave covering fire to their advancing comrades, taking on the OP and the foxhole with the AT-Rifle in the process. The AT-Rifle was quickly dispatched, same held true for a lot of Russian soldiers. The infantry started leapfrogging forward, all the while taking heavy losses from the few remaining Soviets. They also came under flanking fire from the LMG until it was in turn dispatched by the MG-42´s. In the end only one Russian remained, but he managed to severely wound the German Officer and kill one NCO? I guess this happens if you lead from the front. With the last defender dead, the Germans blew up the OP and moved on (with the exact minimum required for a decisive victory, which certainly did not feel like one). The Germans suffered 19 losses (KIA & WIA) with 10 men surviving, the Russians 21 losses (KIA and WIA) with no survivors. After this scenario the score is 26 Victory Points and 6 Attachment Point for the Germans versus 19 Victory Points for the Russians. The second game took place on the 4th of July 1943 as well. And again the terrain was quite open. There were two hills on the German side of the table, one of them wooded. There were three other woods. One in the soviet deployment zone, one (from the German POV) slightly off left from the middle of the table and one on the right flank. The most striking feature was a small river dividing the table from left to right, which was spanned by a wooden bridge. 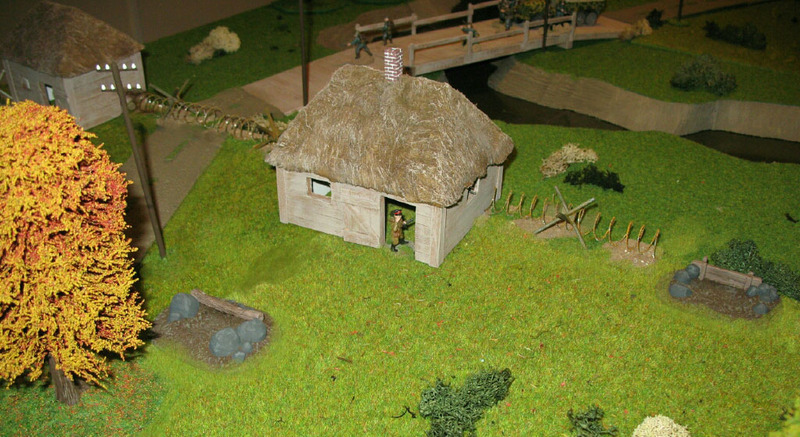 There were two wooden houses in the soviet deployment zone. Just like before the Russian player would set up dug in. Plus he had barbed wire defences at his disposal. The German player could make use of 3 infantry squads with one MG42 each and mounted on trucks. One of them would only arrive on turn 4, due to me having rolled a 4 on a D4 when checking for their arrival. In addition there was an infantry command group mounted on an unarmoured halftrack. 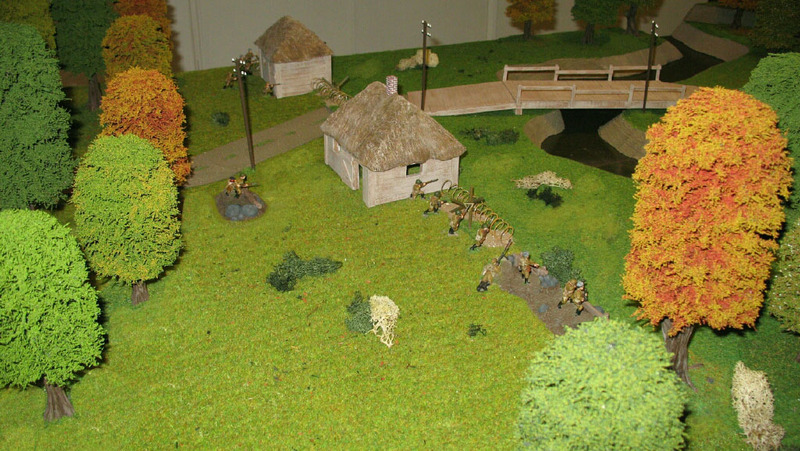 The Russian player had an infantry platoon command (great name for two men), a rifle squad with one LMG, an anti-tank-rifle team and a radio team at his disposal. The Soviets had to either hold both buildings or to take and defend the woods on the right flank with at least ten men. Fulfilling both would be a decisive victory. The Germans had to prevent the Soviets from achieving either. 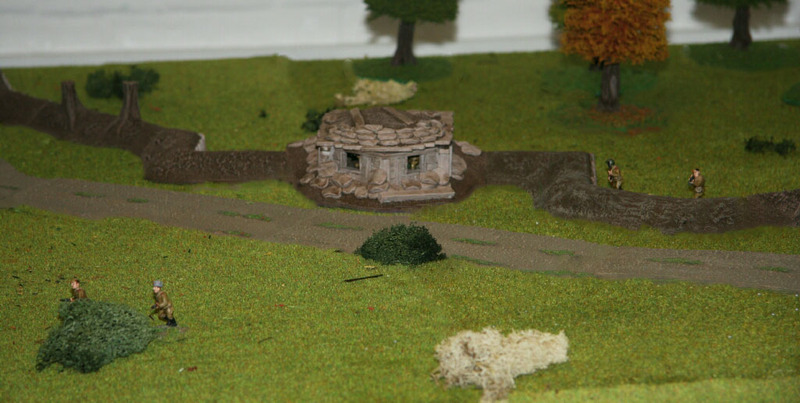 The majority of the Russians set up in either foxholes or the buildings. 12 men set up behind the building on the right to take the woods once the game began. With the exception of the command group all the Germans began dismounted and along their table edge. The group inside the halftrack was meant to make a fast advance on the left and cross the river, while being covered by the remaining infantry. Since the Lieutenant wanted to retain direct command over the majority of his men, one of the riflemen took his place in the halftrack, while he stayed behind. The Germans took a systematic start to the game. The two machine guns took positions on the hill taking the soviet positions under fire, while their comrades slowly advanced. On the Russian side part of their infantry took a dash from the houses to take the woods that were part of their victory conditions. This proved to be a very bad decision, since it put them right into the field of fire of one of the German MG´s and they took heavy losses. But for this MG it was not a walk in the park either. It gunner was quickly killed by the Russian LMG emplaced inside one of the buildings. This resulted in the second MG taking the house under fire. The Russian LMG gunner took cover. Meanwhile one of the infantrymen took the position of the dead gunner and recommenced fire on the advancing Russians. But this is not where the story ended. The Russian LMG started firing again despite the incoming fire and killed the replacement machine gunner. And then it started all over again. The Soviet LMG was forced to take cover, only to come back up again shortly after another trooper had taken over the first German MG to kill him. 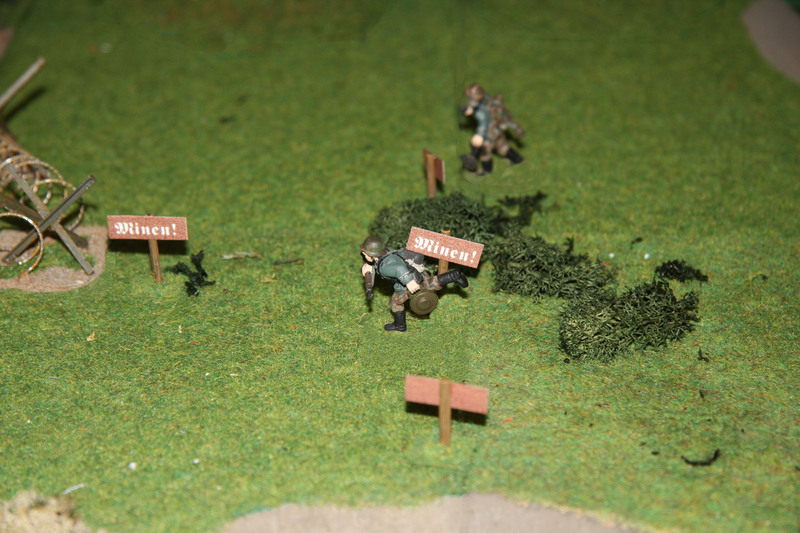 Just when we were afraid that this might go on forever, the second German MG killed the Soviet LMG gunner. The Russian infantry had stopped its advance to the woods… there were simply not enough men left to fulfil the victory conditions. Since the Soviet player had no chance left to achieve a decisive victory, he decided to concentrate completely on defending the buildings. What had happened on the other flank in the meantime? At first the halftrack had been able to advance without being molested. Once it had crossed the creek, the defenders realised, what was coming at them and commenced firing. 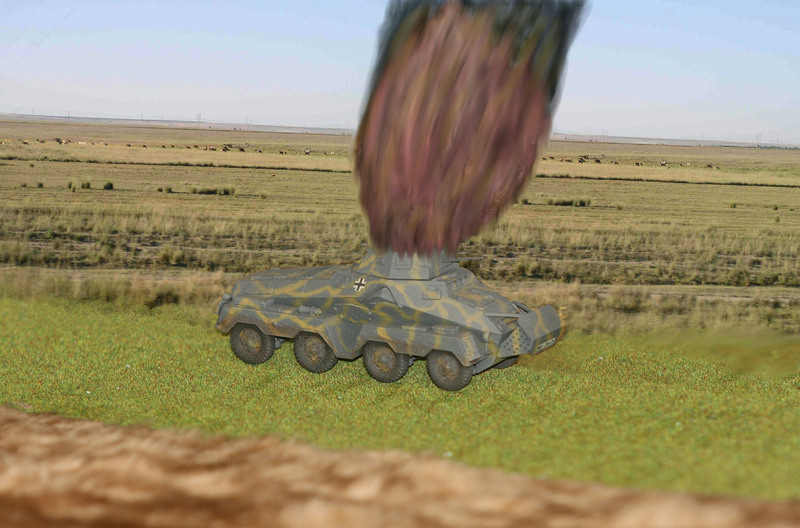 The infantry weapons failed to do much damage and the vehicles kept advancing towards the Russian foxholes until the AT-rifle scored a hit in the engine block, setting it on fire. 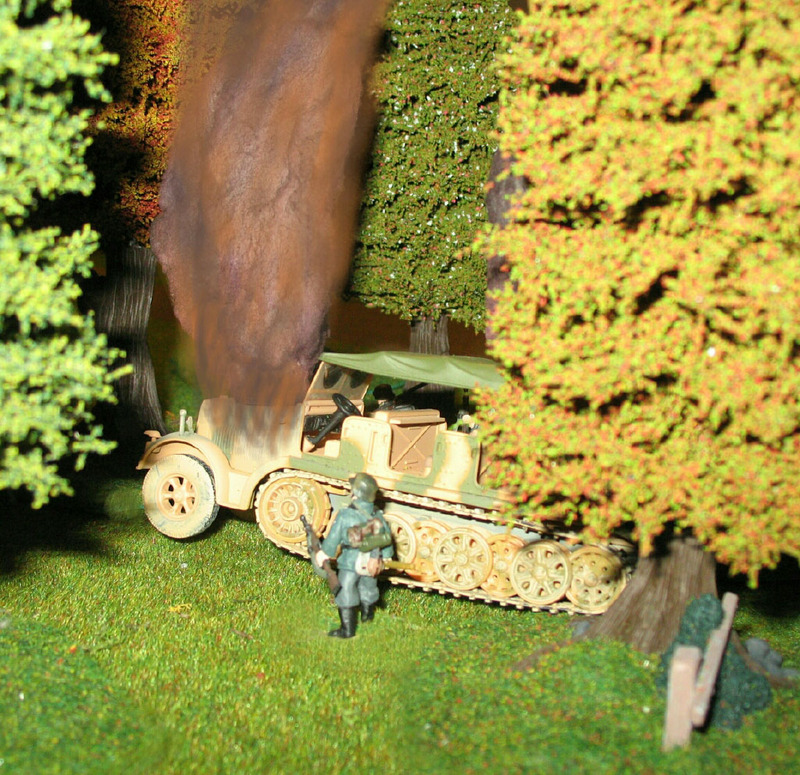 Two soldiers were unable to get out of the burning halftrack in time. The rest of the squad went into position around the burning wreck, trying to expel their opponents from the foxholes using hand grenades. The Russians defended themselves in turn. But both sides only had limited success. The Russians simply lacked the range and they Germans, even though using stick grenades, did not throw well enough. When the Germans had lost two men, but the Soviets only one in this exchange, the German NCO charged through the Russian crossfire, firing his SMG from his hip and cleaned the foxholes. This virtually broke the Russian resistance. 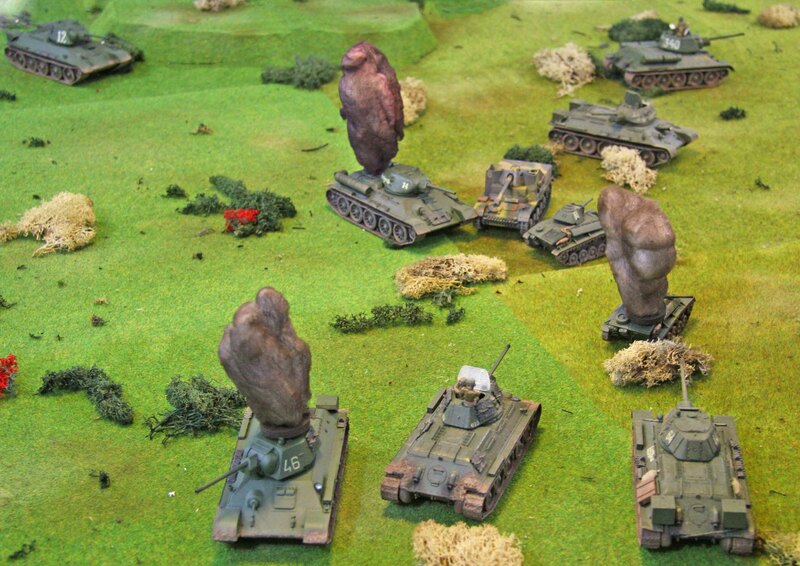 So the Infantry began mounting their trucks to advance on the Soviet position. At the same time the 3rd rifle group finally entered the table. Driving their truck at top speed, they drove up to the bridge, taking it. 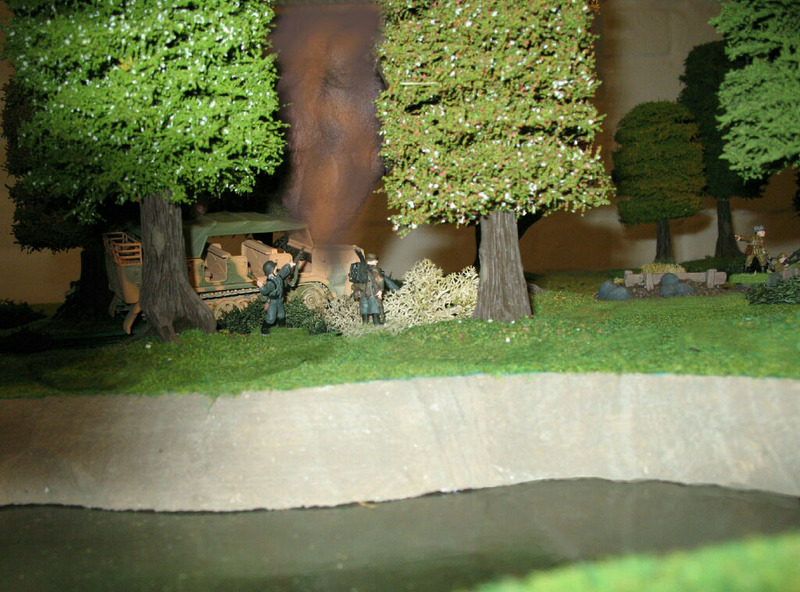 Together with the remaining soldiers from the halftrack they cleared the buildings, thereby securing the German victory in this scenario. All in all the German player secured 27 victory points and 2 attachment points for himself, the Russian player got 12 victory points. Just like he had done before, the German player chose not to use any AP´s to change his troop attachments for the next scenario. The next game depicted the 5th of July. The Germans had to make the most of their previous victories and break through the Russian minefields. 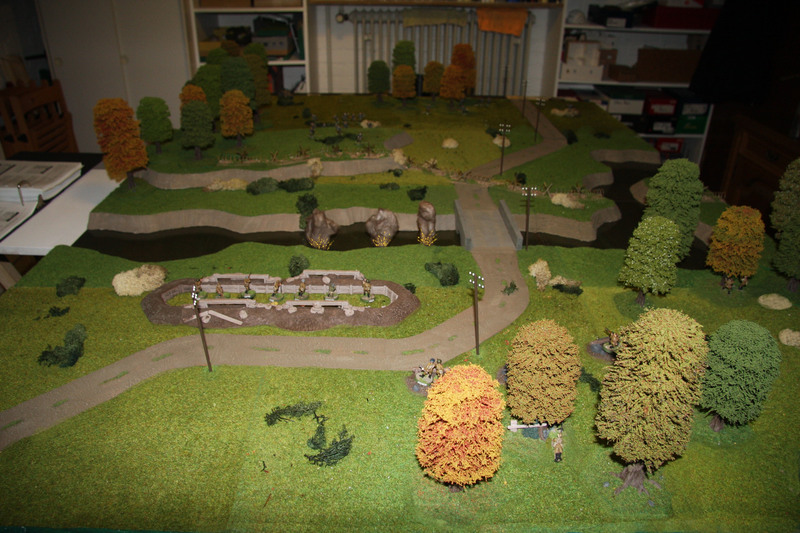 The table (again from the German POV) was flat, except for a hill on the right flank. It was cut left to right by a small river. There was a road running diagonally from the top to the bottom of the table, which crossed the river via a stone bridge. There were a few small woods around the table edges. As before the Soviet player was to set up in fixed positions. His deployment zone was slightly more than half the table. 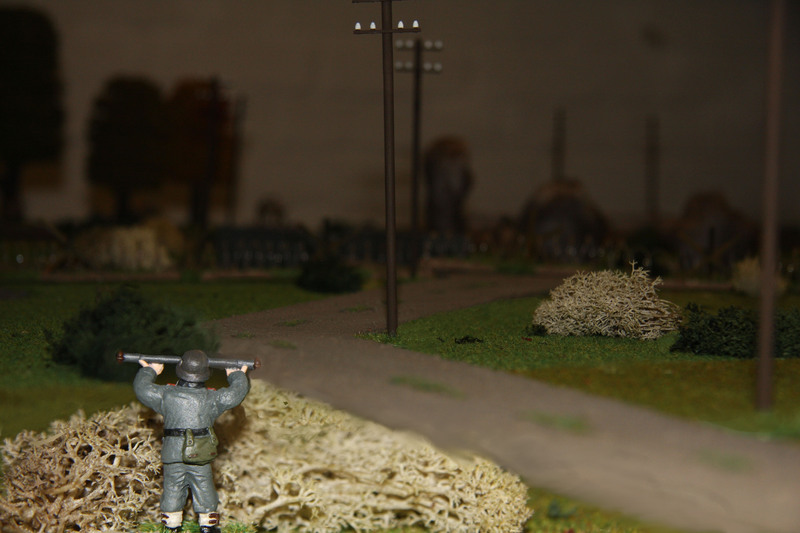 He was also allowed to place tons of barbed wire, a large (hidden) minebelt as well as two small minefields here. 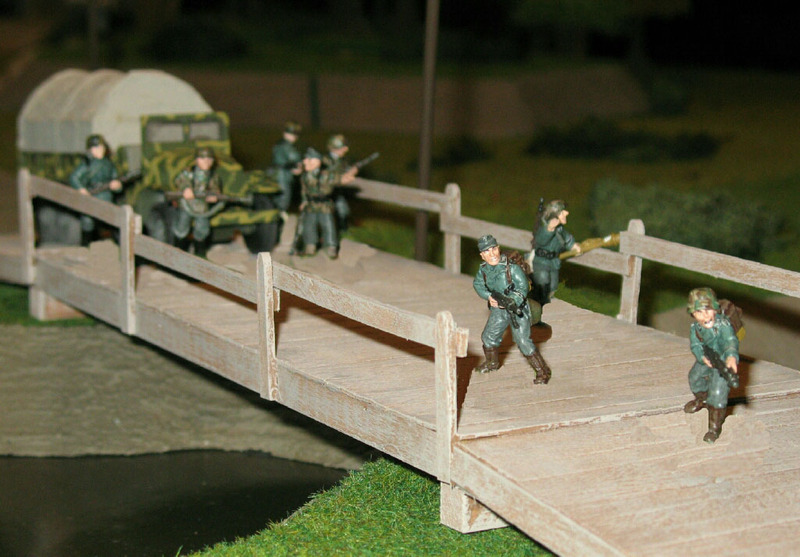 The Germans only had a small strip to set up on their table edge. The defenders had to make do with a small force. There was a command squad consisting of a Lieutenant and two soldiers. In addition there was a 9 men rifle squad, with only one LMG, and an AT-rifle squad comprised by an NCO, two soldiers and the AT gunner. The Germans had a lot more and consisted of highly trained Pioniere. They had a Platoon HQ Squad consisting of a Lieutenant, a Sergeant, two Pioniere and a Kübelwagen. There were two Pionier Squads with two NCO´s, 9 Pioniere (one with a mine detector) and a machine gunner each. They were accompanied by a forward observer who was to co-ordinate their mortar support. Their mission was simply to clear a path through the minebelt. The Russians had to prevent this. Simple enough? is it not? Well the biggest enemy for the Germans was time. The game would last a maximum of ten turns. This would be just enough time to sprint to the far side of the table and only if there was no stream and no barbed wire and no enemy to fire at you. And the Germans had no idea where the minebelt was. If the Russians had decided to place them at the very end of the table there would be no time to clear it. After the Russians had set up things looked even worse. Since they could not be dug in on the stone bridge, one could see that the two small minefields had been deployed there. A quick crossing of the stream was impossible now. The barbed wire ran in one long line across the table on the German side of the river, while the Soviets were all sitting in trenches on the far side. So they could fire at the Germans while they had to deal with both the river and the wire. Playing the Germans I decided to take a gamble. I assumed, that the minebelt would either be right infront of the barbed wire line, or between it and the river. That way I would be occupied to the maximum, while the Russians could pour their fire into me. So the Pioniere were to sprint until they had almost reached the barbed wire and were only to start looking for mines there. If my assumption was wrong? well then they would find the mines the hard way. Anyway… the two MG´s would stay behind with the officer to give covering fire, while the mortars would fire on the Russian main position. But as the saying goes… no plan survives contact with the enemy. The Soviet fire was murderous right from the start. To have at least some cover, the Pioniere started their advance behind the hill, but once they were on top of it, the first three were KIA. The German MG fire caused minimal damage on the other side and the mortars fell short and continuously landed in the river. When the first Pionier with a minedetector had almost reached the wire more of his comrades had fallen and he started his search? finding nothing. I must have been wrong. One of his colleagues went forward to cut the wire and stepped on a mine. Another search showed that the minebelt was here indeed, but that the detector had failed to find it. Now the first three Pioniere started clearing a path under constant fire. Since the other Pioniere could do little to help them they started firing at the Russians and with great success. Their losses still mounted, but when more and more Soviets fell, the pressure on the Germans eased. One man caused another mine to explode while clearing it, but then the path was cleared. When the Pioniere closed on the bridge the 3 Russians still alive capitulated. All in all the German player secured 26 victory points and 2 attachment points for himself, the Russian player got 20 victory points due to the high losses he had caused. The fourth game was the first from the second campaign and depicted events from the 6th of July. It was also the first game in the book that pitted armoured forces against one another. 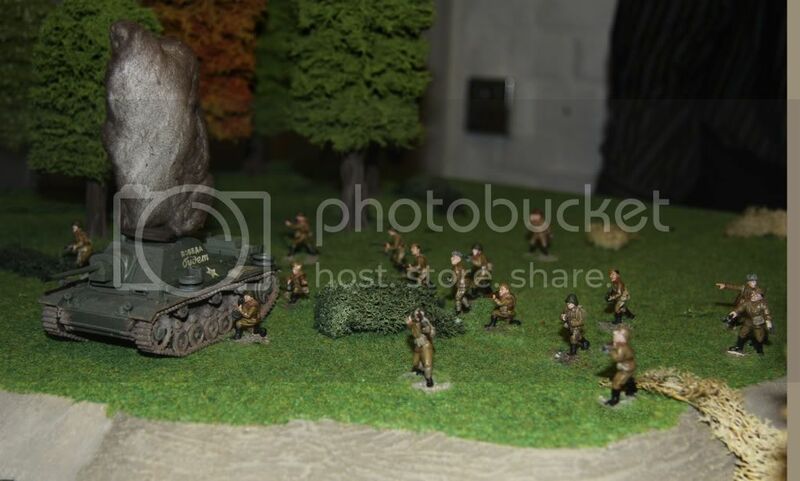 It re-enacted the German attack on Hill 247 which was only taken after 8 attempts in real life. Except for the target hill on the Russian edge the terrain was flat. 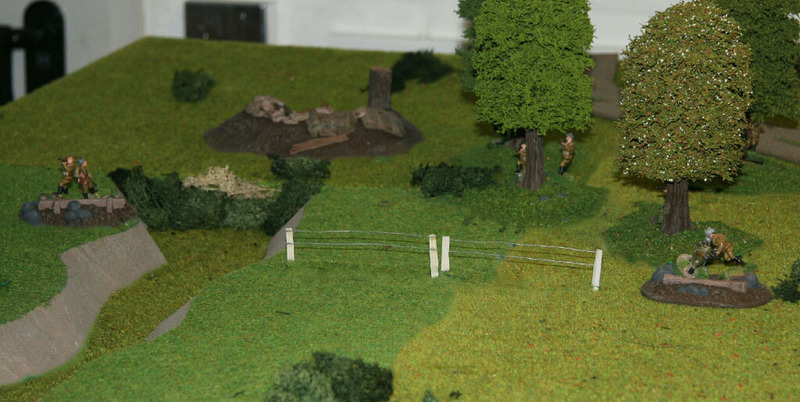 There were a few light woods in the German deployment zone, on the right flank and in the left Russian corner. In the middle of the table were two large corn fields, where the ground was very soft. Behind the right one was a large stone pile and there was a barn behind the left field. The Russians had a Command Squad with a Lieutenant and a soldier, a Rifle Section with an NCO, 7 soldiers and a LMG gunner, as well an artillery spotter at their disposal. In addition there was a 45mm AT gun with crew, as well as two T-34/76´s, all of them dug in and camouflaged. Except for the Rifle Section which deployed behind the stone pile everyone else dug in on the hill. Oh and there were two hidden minefields as well. All the German troops were motorized. There was the Panzergrenadier Platoon HQ mounted on a SdKfz 251/10 consisting of a Lieutenant, a Sergeant, three Grenadieren and two gunners for the 37mm gun. There was also a Grenadiergroup inside a SdKfz 251/1 which featured two NCO´s, four Grenadiere and two MG-42 teams. In addition there was a 8cm mortar on a SdKfz 251/2 with a spotter team, two StuG IIIF, two Marder III SP (one represented by a Marder II) guns and two SdKfz 234 scout cars. The Germans had to expel the Russians from the hill, they had to prevent this. For a decisive victory the Germans were not allowed to lose more than two vehicles, while the Russians had to destroy 5 or more for a decisive victory of their own. 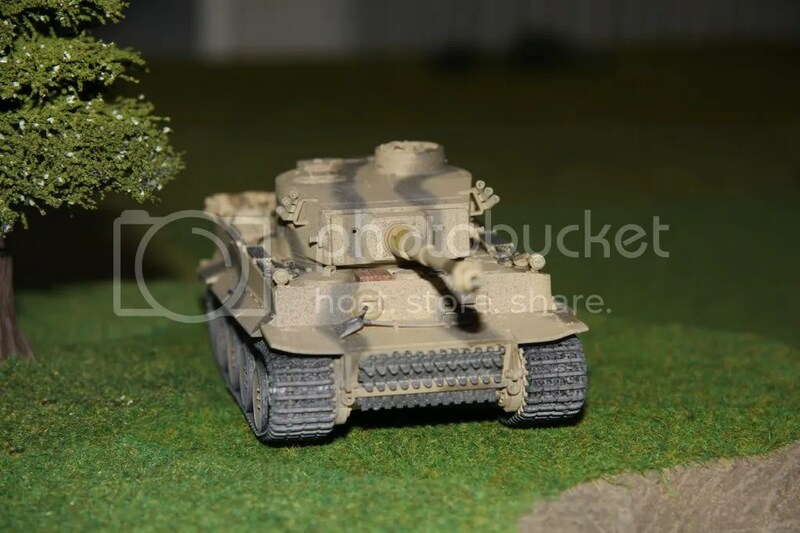 Due to their weak armour the 251´s became a real risk for a German victory, So all 3 of them stayed hidden behind one of the woods in the German deployment zone. The Grenadiers were to wait here until the T-34´s had been dispatched, while the mortar would fire at the Soviet positions with the aid of its spotters inside the woods. The remaining vehicles would advance over the flanks. 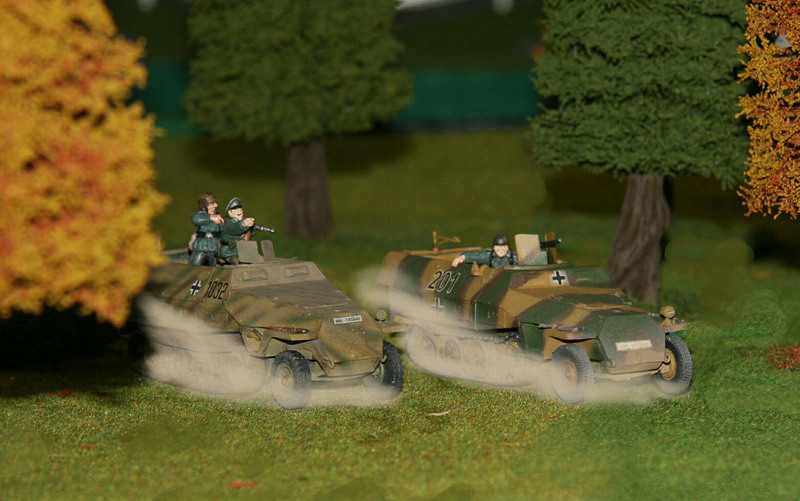 The scout cars would bring up the flanks, with the Sturmgeschütze next and the Marder in the middle. The scouts were in danger too since they too were only lightly armoured, but they were supposed to use their high-speed in their defence. Plus? 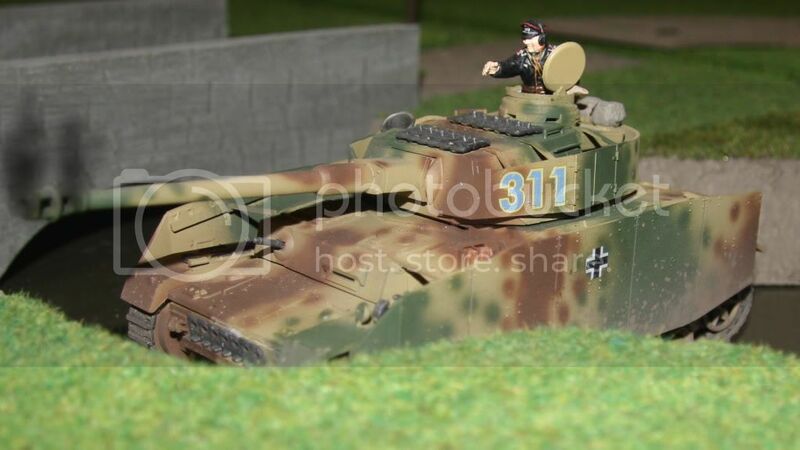 they had to advance fast to spot the T-34´s in case the SP guns failed to do so and if push came to shove they had to attack the from behind with their autocannons. 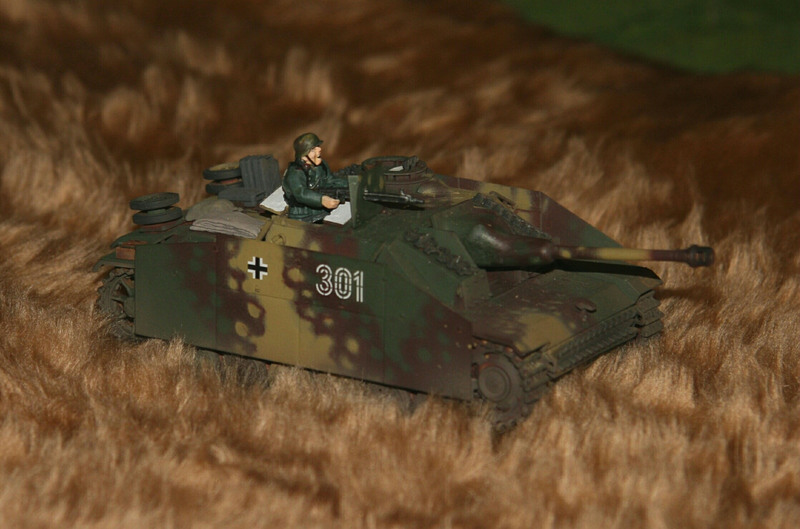 The Marder too had to stay on the move, since their armour was inadequate, too. So the Germans started their advance, while the crews tried to spot the Russian tanks with limited success. The Soviet infantry stayed calm. Just as the scout car on the left pushed through a minefield that had been hidden between the field and the table edge without taking major damage it spotted one of the T-34´s. but before it could radio on its findings, both tanks shot at one of the Marder without scoring a hit, but giving their positions off anyway. Now all German guns stopped and fired at the tanks. But they either missed or the shots got stuck in the earth in front of the dug in tanks. At this very moment the Russian AT gun fired at the left scout car setting it on fire. Just the rear driver got out in time and managed to save himself. At once one of the Marder reloaded and scored a direct hit on the AT position. What followed showed the big weakness of the early T-34´s. Since the commander had to handle the gun and command his crew he could do neither very effectively. Before they had reloaded, the Germans were always on the move again and the Russians missed their moving targets. So this turned into a game of cat and mouse. The Russians shot at the moving Germans and missed. They in turn stopped to fire but only hit the earthen positions most of the time and were back on the move before the Soviets returned their fire. Then three things happened almost at once. One of the Marder got stuck in the soft ground of the fields. 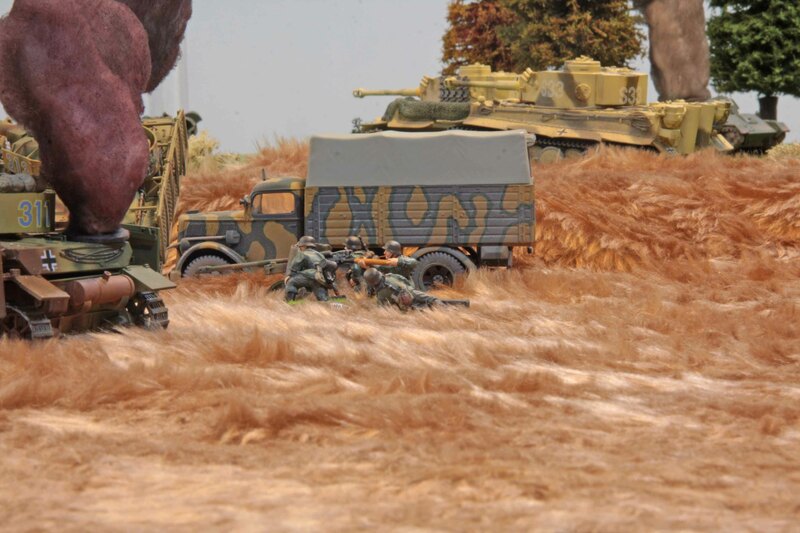 While the driver tried his best to get it unstuck, the crew saw one of the T-34´s taking aim. They quickly reloaded, fired and hit the turret. The shot pierced the armour, set of the ammo stored there and the tank exploded. The second T-34 tried to take revenge but narrowly missed the stuck Marder. Shortly after it got itself free and moved on. 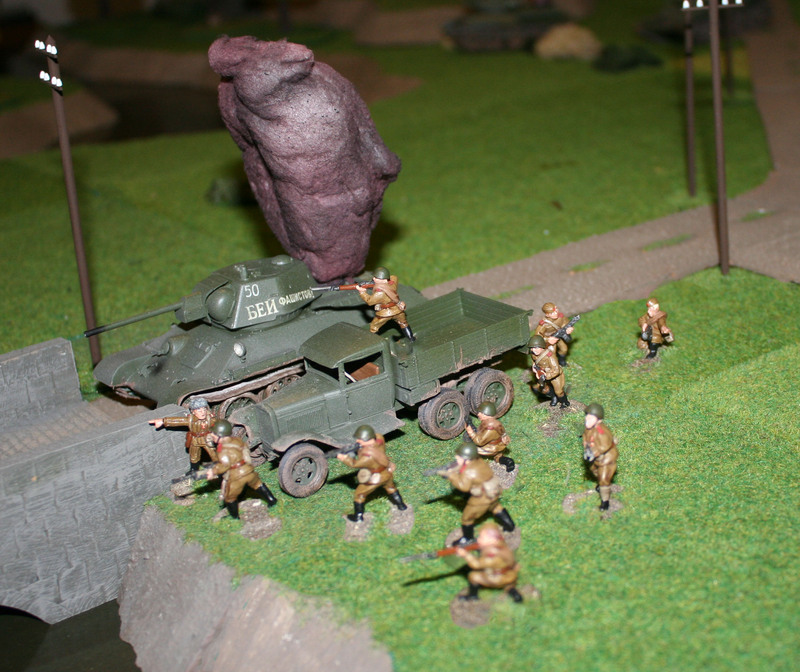 Now the Russian Infantry opened fire on the remaining scout car. 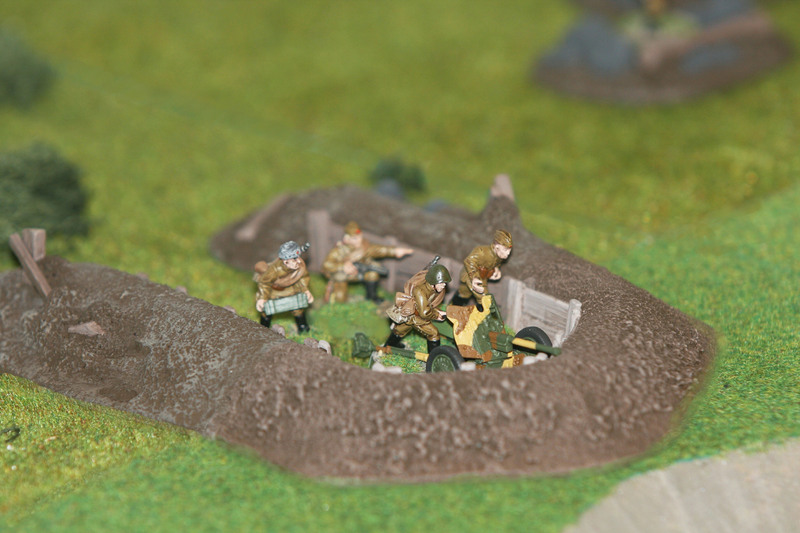 The rifles could not do any damage, but the LMG pierced the turret, destroying the 20mm gun and killing the gunner. The driver decided to take revenge and speeded towards the soldiers behind the stone pile. Five could not evade and were run over. While the scout car turned to run over the foxholes on the hill the rear driver moved into the turret and manned the MG.
Just at that moment one of the Sturmgeschütze hit the remaining T-34 and set it on fire. Now the Panzergrenadiere moved off to clear the hill and the SP guns switched to HE ammo. The very first shot from one of the Marder hit the foxhole with the spotter, who was still trying in vain to call in an artillery strike. The other trenches were hit in quick succession and the Russian position was completely annihilated. All in all the game went surprisingly fast and did not even last three complete turns. Too fast for the German mortar, which was still ranging in at that time. Just as surprising the Germans only lost one scout car and only 4 crew between both scout cars. The German player got 31 victory points and 6 attachment points for himself, the Russian player only got 5 victory points. While the German player only rolled a poor attachment for the next game (two Panzerkampfwagen III), he chose not to use any AP´s since they would not have changed the result. As some might have noticed, I have hardly gotten to play so far this year. Since it could not remain this way we finally played the next scenario from the SkirmishCampaigns “Großdeutschland at Kursk” book last Sunday. 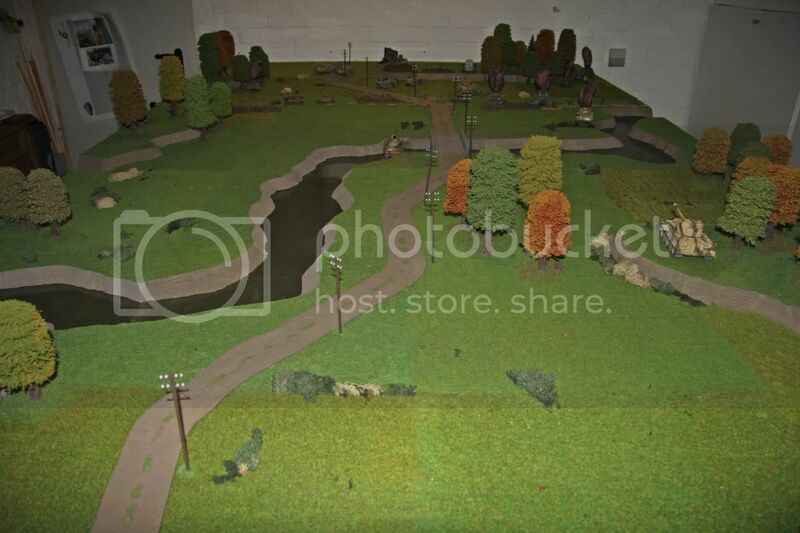 It was also the first chance to use the terrain boards after their makeover earlier this year. While the all green hills felt strange while setting things up, I am pleased with the over all looks in the end! Again for those of you who are interested in how thing went so far… here are the first 4 games and the grand total results (just click on the tabs). Game numbers 5, 6 and 7can be found on this blog. As usual I am going to tell the story from my (the German) point of view. The game is set on July 10th 1943. 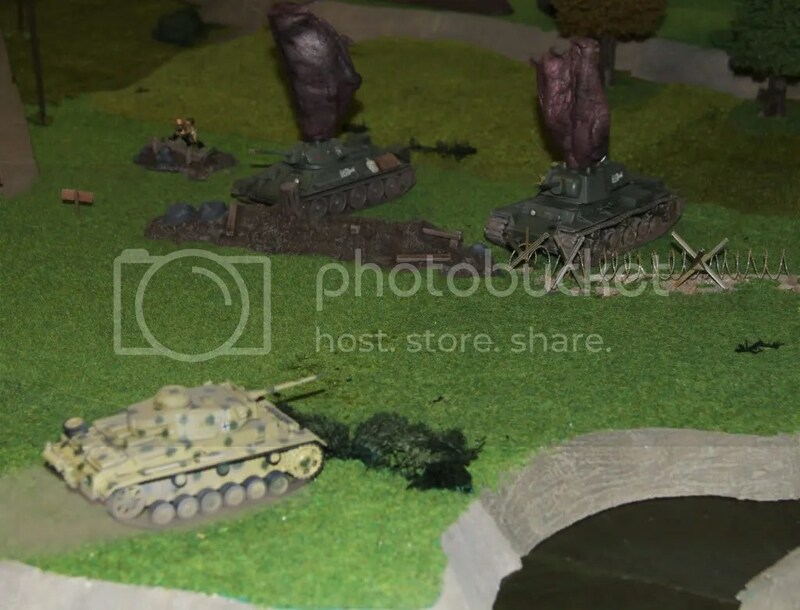 It re-enacts a German assault on a Warehouse near Berezovka by elements of the Panzergrenadierdivision Grossdeutschland and attached tanks from the 10th Panther Brigade. The Germans featured two 12-men Pioneer Squads (one with a flame thrower the other with a mine detector) mounted on SdKfz. 251/5s, a Mortar Team with an 8cm mortar, two PzKw V “Panther” and four PzKw IV. [Note: I will be using the German meaning throughout the report. So please do not be confused, but there is no plural “s” with Panther in German.] The Panther were very early production models and had to roll for a possible breakdown every time they moved. I also had reinforcements in the guise of a PzKw III and a Flammpanzer III, which would arrive on round two (determined by a dice roll). The Soviets had a 9-men Rifle Squad, a Maxim MG Team, an artillery observer who could call in fire from two 12cm mortars, a 76,2mm Field Gun (the famous crash-boom), two SU-76 and one SU-122 assault guns. The Soviets could all start in foxholes and trenches (and they did so), the vehicles dug in and camouflaged. In addition to the barbed wire cutting the table in half, the Russian player could also deploy a good number of both anti-personel and anti-tank minefields. Not enough to mine all approaches, but enough to give me some serious trouble. None the less, we both agreed that the scenario greatly favoured the Germans and that it would be extremely hard for the Russians to win. 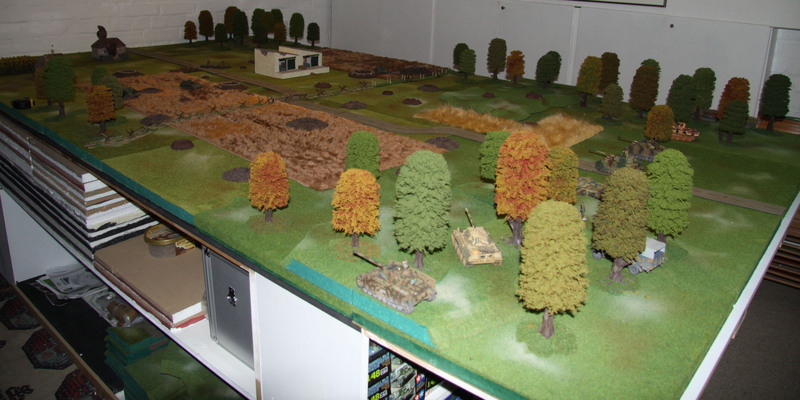 The table featured mainly open plains with a low hill to the left of the German deployment zone and another one on the right flank before it. There were a few light woods and numerous fields on the table, none of the crops being high enough to hide a men. A road ran the length of the table in the middle. Besides the warehouse, a big structure on the right, there were two wooden houses near the Soviet edge of the table, one of them being on fire. A liberal amount of craters dotted the area courtesy of the German artillery and fighter-bomber preparation. 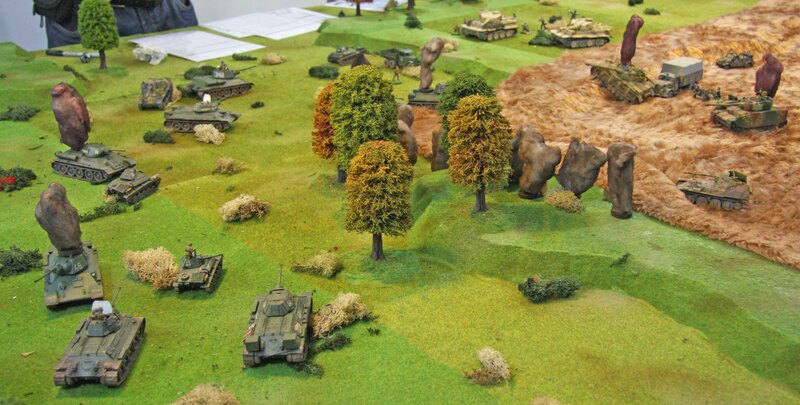 The Russian player chose to deploy his SU-122 and one of the SU-76s on the left flank, the other together with the crash-boom and some infantry on the right. The rest of the infantry was scattered in shell holes along the front and three of them hid behind the warehouse (a sort of counter offensive force should I take it). 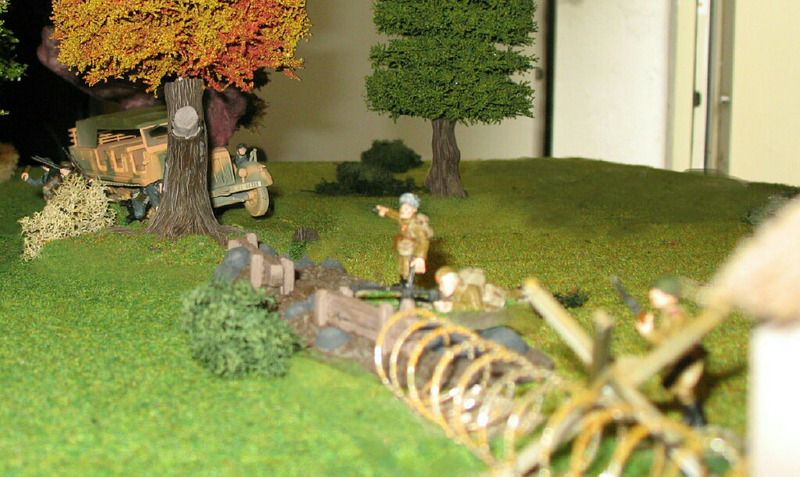 The HMG team and spotter team hid in foxholes and a trench atop the road. My deployment was quite simple. The mortar team set up behind the hill in my deployment zone, out of sight of the Soviets, with only the NCO lying atop the hill to direct their fire. The Panzer IVs deployed the whole width of my deployment zone, the Panther one to each flank. Each tank would start the game at full speed. The Pioniere waited in their half-tracks inside the woods on the right. The idea was for the tanks to clear the opposition before they would move forward to take the warehouse. The Panzer IV were meant to breach the barbed wire on the flanks since I hoped that only the direct approaches would be mined (this would prove right on later inspection). Since the dug-out for the field gun was almost touching the right table edge I decided that I would only do so on the left flank. The Panther would only move forward a little, giving fire support with their high velocity 7,5cm guns. The mortar team would support these moves and try to take out the crash-boom and the HMG. The game was not up to a good start for me. I had hoped that the tanks speed would give them enough protection against the Russian gunners. But when the left hand SU-76 opened fire on one of my PzKw IV it scored a hit anyway. It killed the driver and commander and did heavy damage to the road wheels and tracks. The tank became slower due to the damage and the fact that a dead driver can not keep his foot on the throttle and thus became a far easier target when the self-propelled gun fired off its next shot. That one ruined the wheels and tracks completely and killed rest of the crew. The tank would be salvageable, but was out of the game without ever firing a shot. 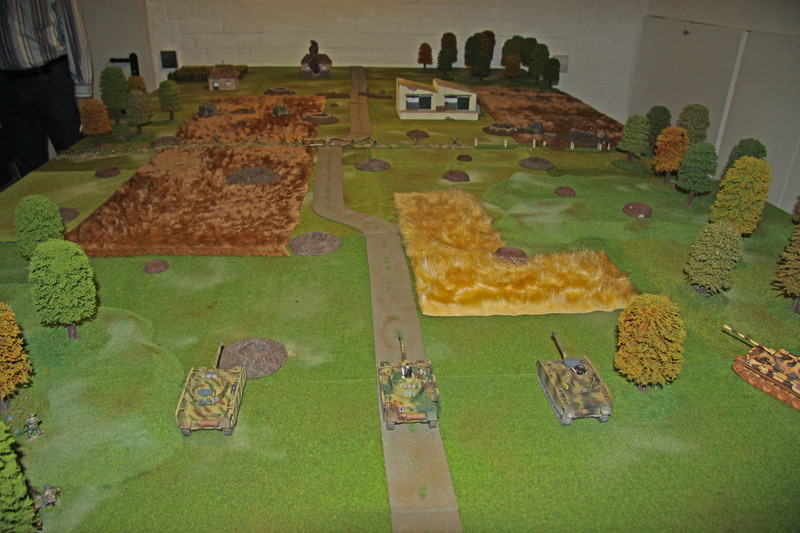 The Panther on the right flank did not get off to a good start either. It botched its breakdown roll on its first move and would only be able to move at a snail’s pace due to a damaged gearbox. Unfortunately this would mean that it had to end its move with its flank open to the right hand Russian positions. Not a good start! This was somewhat set off by the fact that my mortar team got in action quiet well. Their first shot landed on the parapet of the field gun position. It only rattled the gun crew, but they were quickly able to adjust their fire and the next two shots landed smack in the middle of the position killing the crew and disabling the gun. The left flank Panzer IV took revenge for its mate and fired at the SU-76 which had given its position away. Even though it was dug in, the first shot hit true, set off the ammo inside and killed the crew. 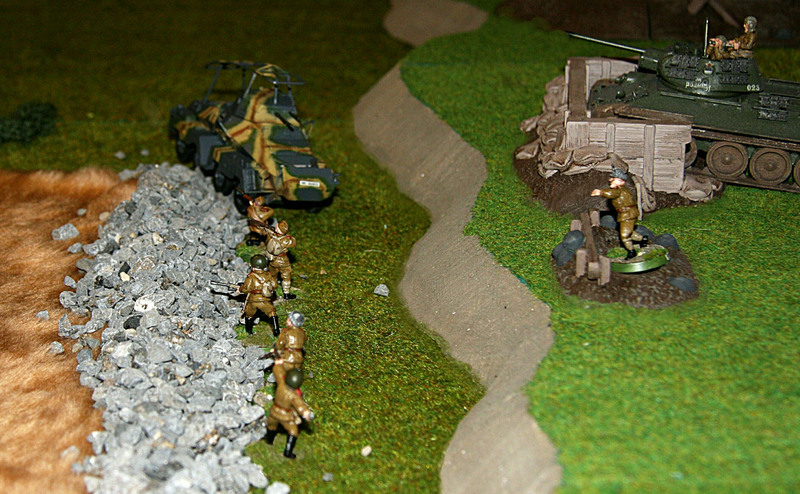 With half the Russian AT-firepower out of the game things were beginning to look good for the Germans. So the SU-122 felt it was time to add some spice to it all and fired at my limping Panther, but missed it. So the Panther decided to return the favour. It hit, but the shot deflected off the armour. Which was not too bad since it ripped open the fuel tanks and set the assault gun on fire. The crew managed to get out, but there went the Russians biggest gun. 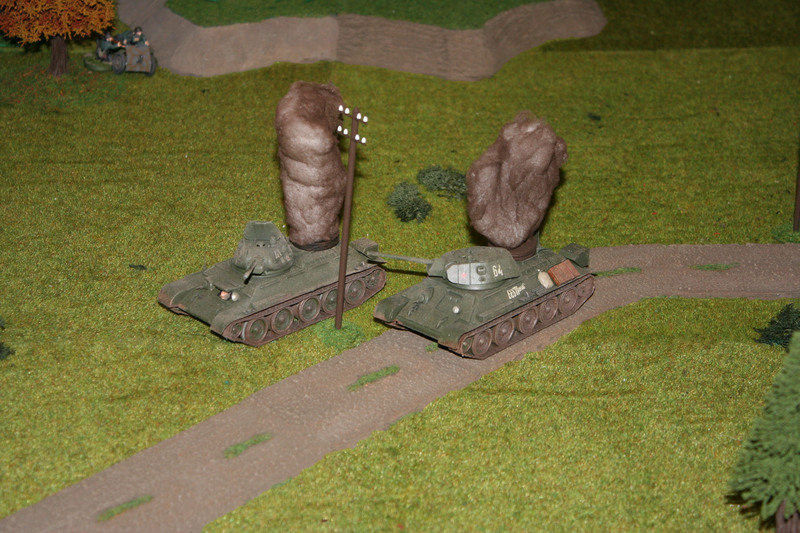 But now the remaining SU-76 took its turn and hit the slowed Panther in its flank. The shot penetrated the armour and hit the engine, setting it and the whole tank alight. The crew of the SP-gun did not have much time to celebrate. Now that it had given away its position as well, the remaining Panther fired on it. Just like its brother the armour proved to week for the high velocity gun and again it went up in a ball of flames. 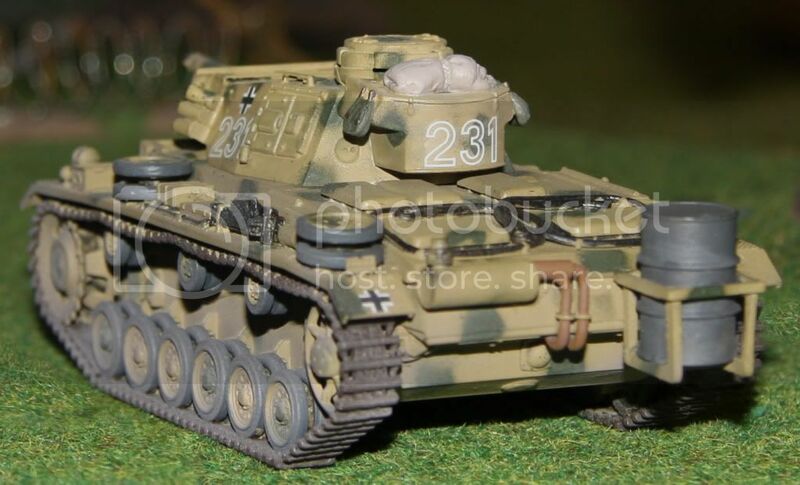 With no danger for them left on the table the Panzer all stopped to be more stable firing platforms and reloaded with high explosive ammo to take care of the infantry. The Soviet off-board mortar fire arrived, but the shots scattered wide and did not hit the PzKw IVs it was aimed at. When the first 7,5cm shell hit a shell hole killing its occupants and the men hiding behind the warehouse started taking losses as well, things did not look too good for the Russians. The approach of the two Panzer III did not make things any more pleasant (especially the prospect of the Flammpanzer). When they saw the Pionier half-tracks moving up as well they lost their nerve and started to run. The Germans had won the day. So in the end it was a German victory with the loss of one tank and five crew (6 victory points to the Soviets). The Soviets lost three tanks, eight crew, one gun and seven men (including the bonus for the game winner, 25 victory points total). So the first game of the final campaign started with a German win again. 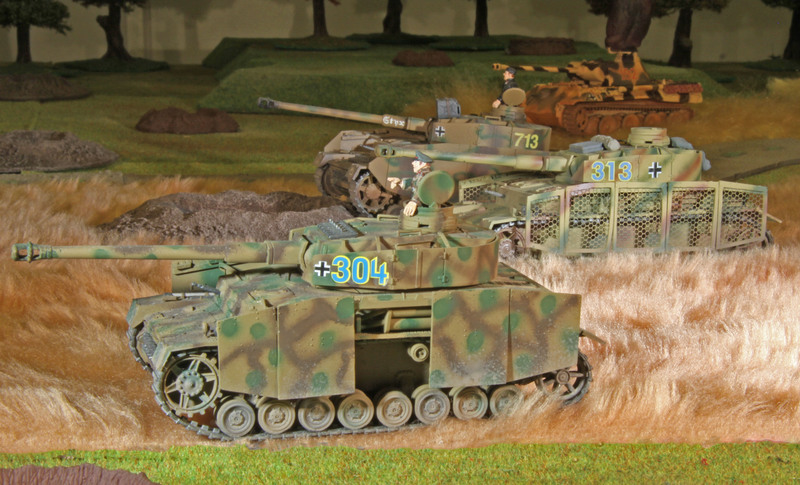 But from now on it would get harder… the final two games will always feature more Russian tanks then German ones. So stay tuned! A last note: I will try to have the whole campaign in this one place. So I will re-post the reports from the first 4 games here as well in coming days. So if you have not read them on our clubs homepage, they will be here soon as well. This weekend we played the next scenario from the SkirmishCampaigns “Großdeutschland at Kursk” book. Again for those of you who are interested in how thing went so far… here are the first 4 games and the grand total results (just click on the tabs). Game numbers 5 and 6 can be found on this blog. As before I am going to tell the story from my (the German) point of view. Please do not be too disappointed if this report will be rather short, as unfortunately this game was a bit bleak. While the game is set during the night of July 9th 1943 it does not depict an actual event, so it could have been any night during the Battle of Kursk. It depicts a German salvage crew trying to repair a damaged Tiger while coming under attack from Russian forces. The Germans featured six men salvage crew, not a proper combat unit especially in quality working on the Tiger at the beginning of the game. 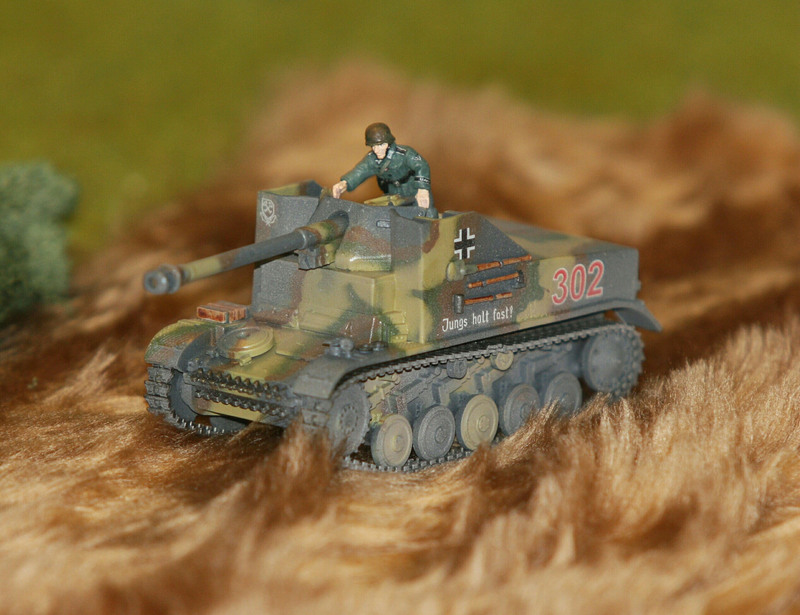 Three men from the Tiger crew would arrive on the table at the beginning of the first round in a Kübelwagen and a Motorized Infantry squad including one LMG would arrive at the beginning of round two. The Soviets had a Recon platoon HQ (Lieutenant and a Rifleman), a nine men Recon Squad that included and LMG and an eight men Assault Squad. 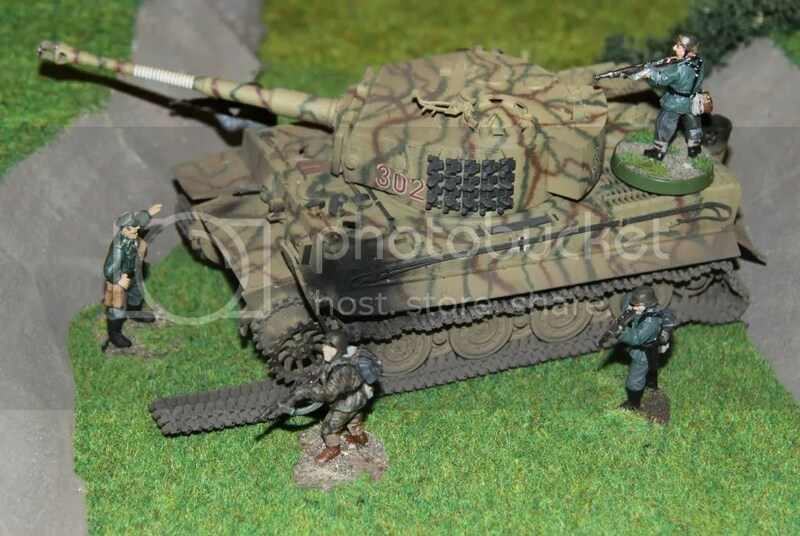 All the Russian units were mostly armed with SMG´s and the Assault Squad had 6 satchel charges to destroy the Tiger. The game was set at night, so ranges were greatly reduced. Soldiers within a unit had to keep tight cohesion not to get lost and you could only fire on targets they had spotted and identified first (unless they had exposed themselves by firing or were illuminated by other means). The Germans were not allowed to make any offensive moves or move towards the Russians unless they identified a thread or were attacked. They were allowed to move closer to the Tiger though. The Tiger itself was immobile and could not use its weapons and all the other tanks on the table were just burnt out wrecks. The table itself was slightly wooded with rolling hills and a gully that ran the middle of the board. The Tiger was located inside this gully. The Russians would win by either killing, capturing or driving off all the Germans or by destroying the Tiger. The Germans had to prevent that. The game began quiet uneventful. The Russians advanced towards the Germans still outside spotting range. 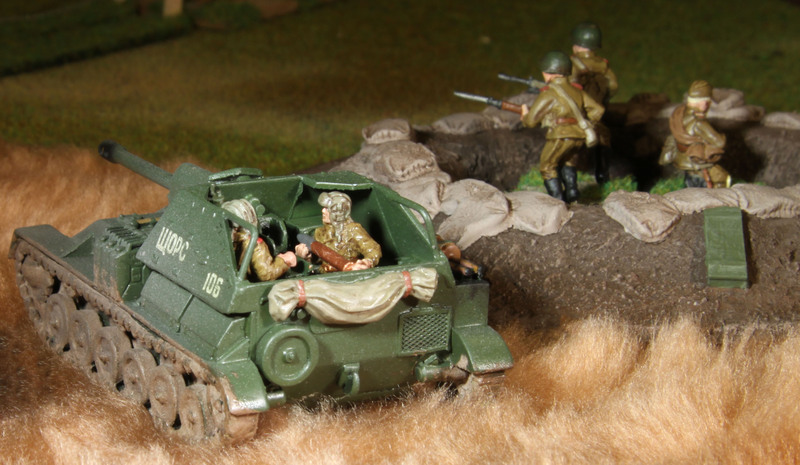 The tank crew moved towards the gully inside their Kübelwagen. Chances for a good shot were slim, so they were driving with their headlights on. One of the few Russians armed with a rifle took the chance anyway, hit the Kübels engine, setting the vehicle on fire. The tank crew got out unhurt, but now the Germans knew what was going on and took defensive positions. 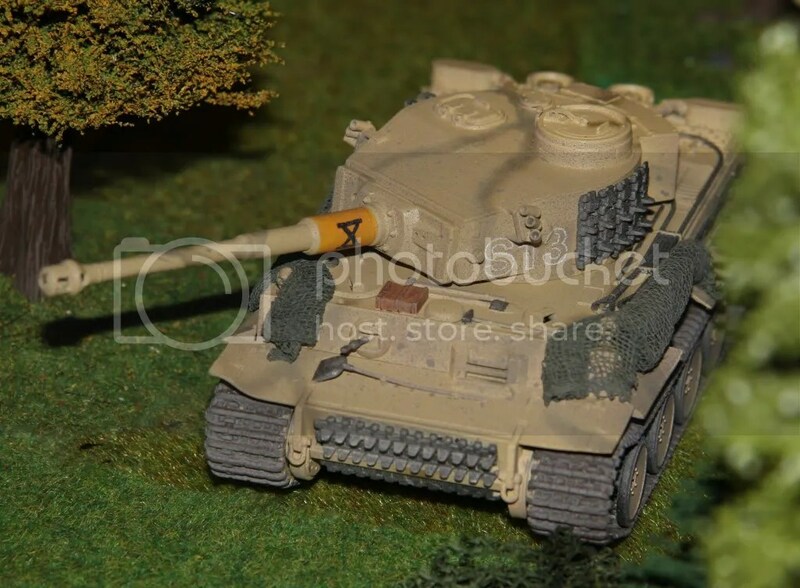 At least the Kübelwagen was far enough from the Tiger not light up the perimeter with its flames. By now things heated up. The German infantry had moved up and strengthened the defensive perimeter. Their LMG team was on the Tigers rear hull, taking cover behind the turret. Some of the salvage crew started to fire in hopes that the Russians would fire back and expose their positions, which they did. Now the LMG had enough targets and after a couple of tries I rolled good enough to set up a firing lane with them, which they kept shifting over the enemy formation. This had a devastating effect on the Soviets. Most of them went for cover or their morale broke, including the officer and all NCO´s. In the process of fighting back the Russian LMG gunner and two of the soldiers jammed their weapons so bad, that they could only be repaired at a workshop. On the right flank the first soldiers had come close enough to the tankers for effective SMG fire. Two of the Soviets were killed and most of the rest lost their nerve. At this point the Soviet player decided to withdraw. He only had two rounds to fulfill his objectives. Most of his troops were pinned down and shaken, under effective machine-gun and SMG fire and there were still enough uncommitted Germans around the Tiger to pick up the pace. Feeling that it was more important to secure the Tiger and how easily things could turn if I pursued at night, I just let them go. So in the end it was a German victory with one German loss versus 3 dead Russians. So the Germans finished the second campaign in the book with 4 consecutive wins. The next one will be the first for the final campaign. 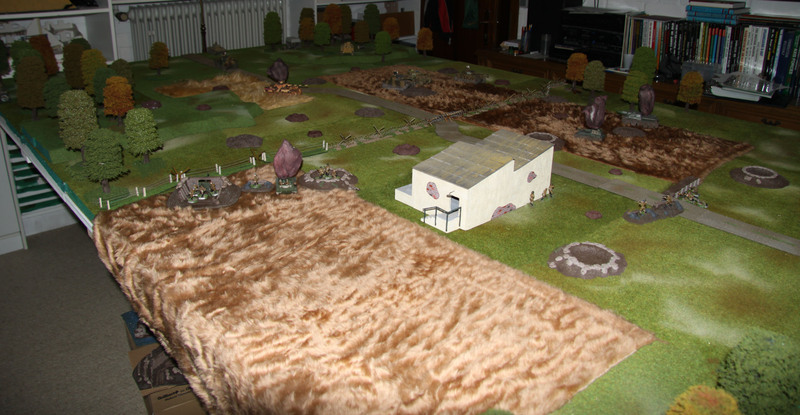 About two weeks ago we played the next scenario from the SkirmishCampaigns “Großdeutschland at Kursk” book. Again for those of you who are interested in how thing went so far… here are the first 4 games and the grand total results. Game number 5 can be found on this blog. As before I am going to tell the story from my (the German) point of view. The game is set on July 7th 1943 around mid-day. In it units from the Soviet 112th Tank Brigade are counterattacking the leading elements of the Panzergenadierdivision Großdeutschland, trying to push through. Being the German player I had 4 PzKw IV´s with veteran crews, a mechanized infantry squad (officer, NCO, two MG-42 teams and four riflemen) mounted on a SdKfz. 251 as well as a 7,cm Infantry gun with crew and a truck. Two PzKw III´s would re-enforce me at the beginning of round four. The Soviets had a total of 7 T-34/76´s, two SU-76´s, a mechanized rifle squad (NCO, one DP LMG team and 6 riflemen with a mix of rifles and SMG´s) mounted on a truck, plus a Rifle platoon HQ (officer and one riflemen). The table was fairly flat, with two large hills on each half of the table. It was cut in half by a small river or creek, which was crossed by a stone bridge. There was a road leading from the Russian side of the table to the German side with a another road leading from the right table edge to a crossroads just off the bridge on the Soviet side. There were a number of medium-sized woods on the table. The river itself had a soft ground (meaning vehicles had to make bog checks to cross it) and it was impassable inside the woods. 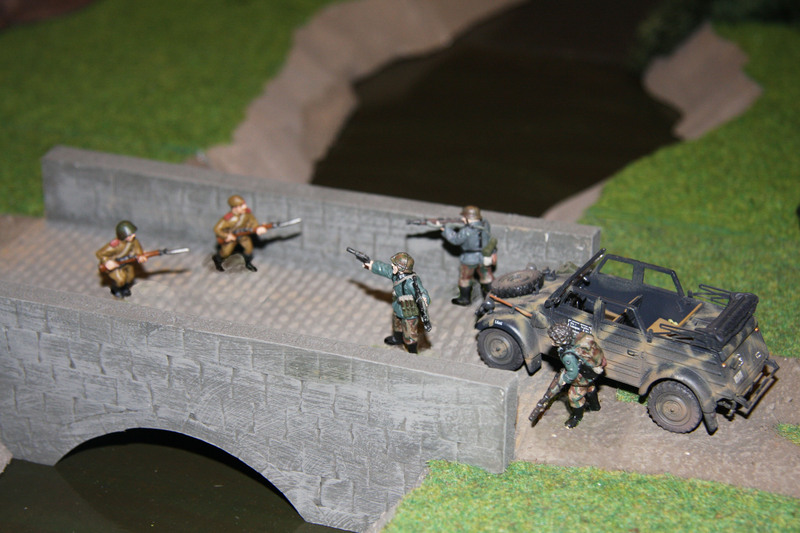 The Germans had about a metre into the table to set up, with the PzKw III´s arriving later along the road. 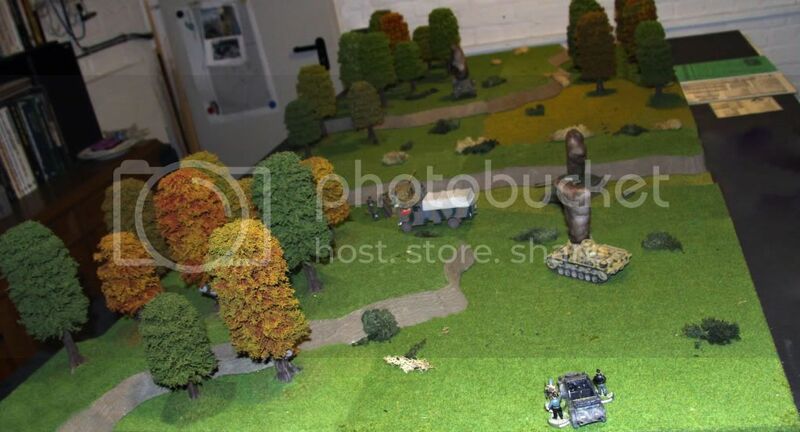 The Soviets would move onto the table either along the road on the far side of the table or my right flank. The game was set for a maximum of 12 rounds. 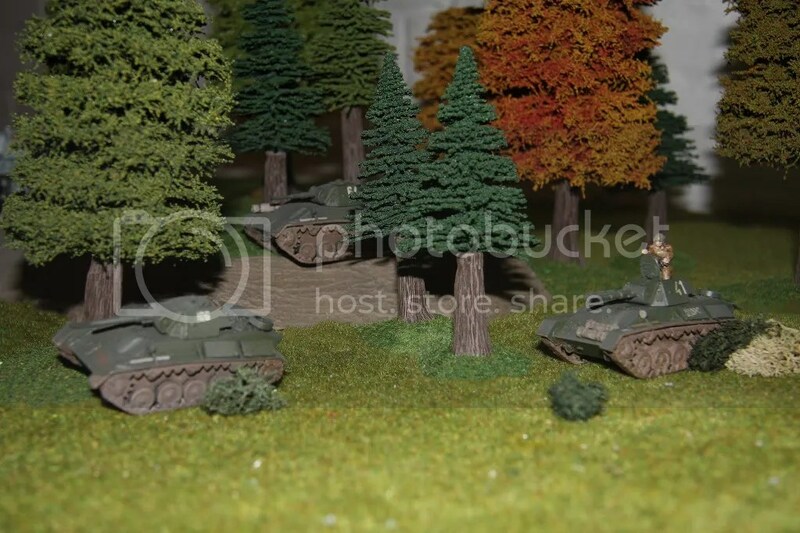 To win the Soviets had to move two AFV´s off my side of the table on the road. For me to win, I had to prevent this. Now the biggest problem from my point of view was, that the Soviets had a total of 9 vehicles (7 T-34’s and 2 SU-76’s) that counted for achieving their victory conditions. In other words they only had to get about 1/5th of their tanks off the board to win this one. And they were fast enough to do that by turn three if nothing held them up. While my tanks (at least the ones that were on the table when the game began) had the ability to know the T-34’s out, they were also just as vulnerable to their fire and every tank lost would reduce my chances to knock out enough T-34´s to win. So I had to find a way to make the most of the resources I had at hand. I decided on a fixed defense. I did not even deploy the SdKfz. 251 or truck. They would be useless for what I planned and would only draw fire. 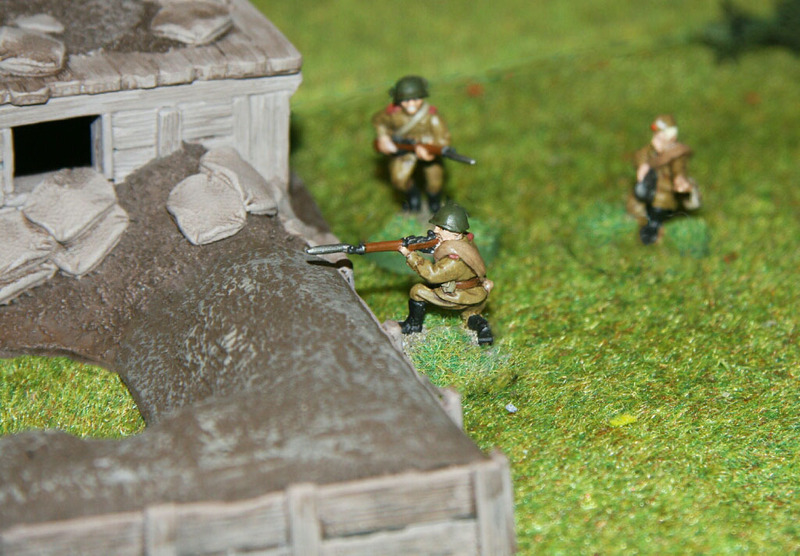 My infantry was deployed inside the woods on a hill right opposite the bridge, in hope that they might cause some trouble for the Soviet infantry or SP-guns. Since the Infantry gun did not have the ammo to take out a T-34 except from the sides or rear, I deployed it on the lee side of my left hill, in hopes that they would be able to get a shot or two off when the Soviets passed them. 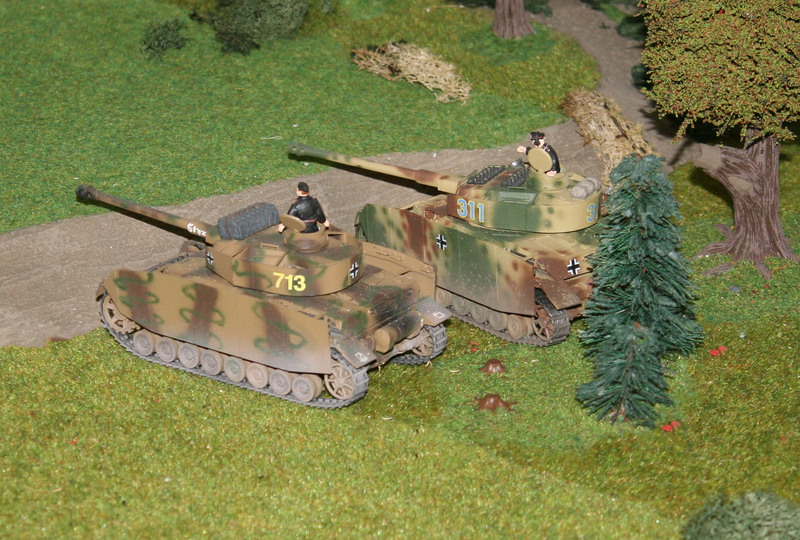 Two of my PzKw IV´s were deployed hull down behind my right hill, one hull down inside the woods behind my left hill. They all had good fields of fire on the bridge. Now there was no good position left for my forth PzKw IV, so it started ahead of the others. It was meant to charge ahead and secure itself a position inside one of the woods with a flanking position on the bridge. The Soviet player split his forces between both entry points. The infantry would use the right flank entry point. In return the far table edge got one more T-34 then the other entry point. All his vehicles started at maximum speed. The game began as expected. The Soviet tanks charged ahead, while I was waiting for mine to fire. By the time the first SU-76 was across the bridge, my advance PzKw IV had taken up its firing position inside the woods and stopped. While chances for a hit were slim (after all the Sp-gun was at full speed) I still risked to fire… and on the second shot it found it´s way home. 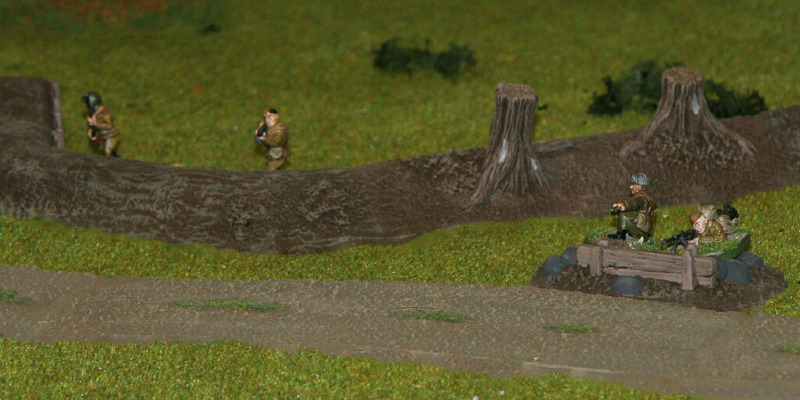 Now the 7,5cm round wrecked havoc in the SU-76´s flank and left it a burning hull blocking off my side of the bridge. But that did not seal it off yet. Since a SU-76 is lighter, a T-34 would still have been able to push it forward, which was just what one of them attempted to do. While a T-34/76 slowed down to push it away one of my right hand PzKw IV took aim and hit it in the turret, setting off the large calibre ammo. The T-34 went up in a ball of flames and the bridge was sealed for good now. Just at that time, the truck with the Russian infantry arrived besides the bridge, they dismounted and started firing at my infantry. The range was already close and it cost me both machine gunners and one assistant gunner. 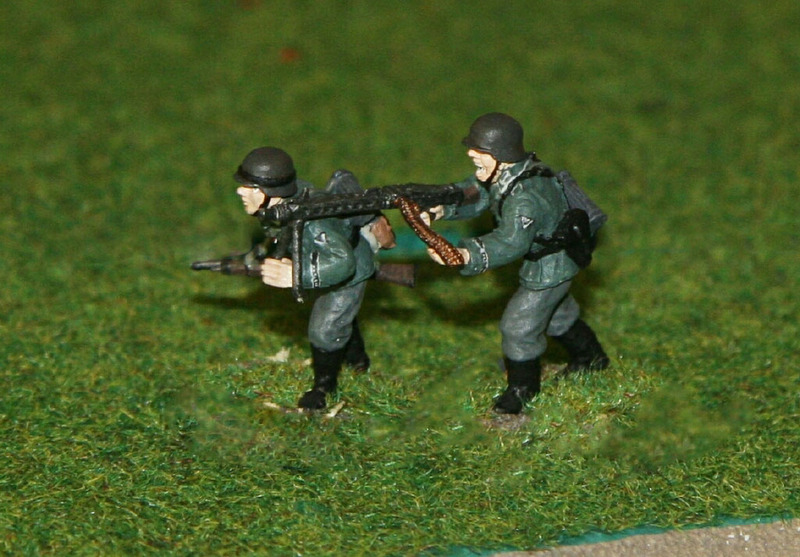 Not one to let these things rest, my officer ordered one of the riflemen to pick up one of the MG-42´s and return fire. And a hellish return fire it was. Between the machine-gun fire and the fire put up by the riflemen the Soviet infantry was killed to a man. The rest of the round showed the big weaknesses of the earlier T-34´s. The commander had to do all the aiming and firing himself. As a result most of the T-34´s only got one shot off at best at my tanks and they all missed, also on account of the high speed they were travelling at. In return my tanks managed to take out another T-34, again hitting its ammo supply. The second round began just as bloody as the first had ended. 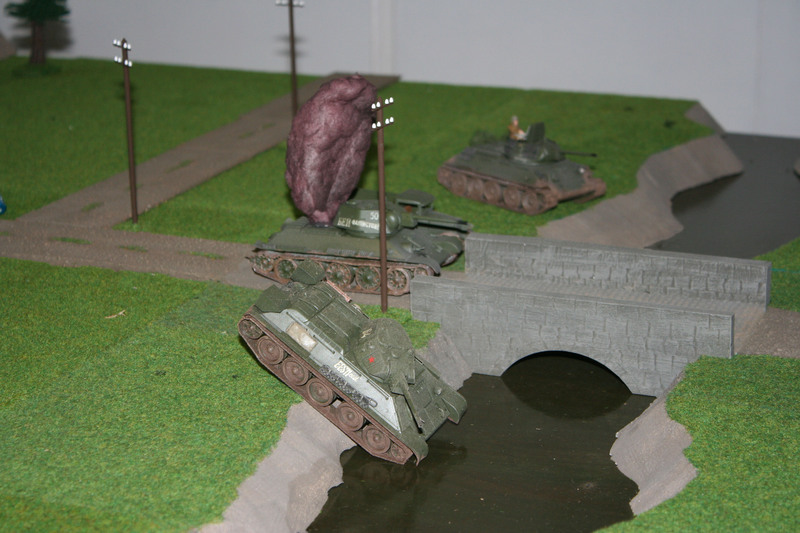 The first T-34´s began to cross the river. One (the one in the back of this shot) was taken out just before he went down the riverbank. 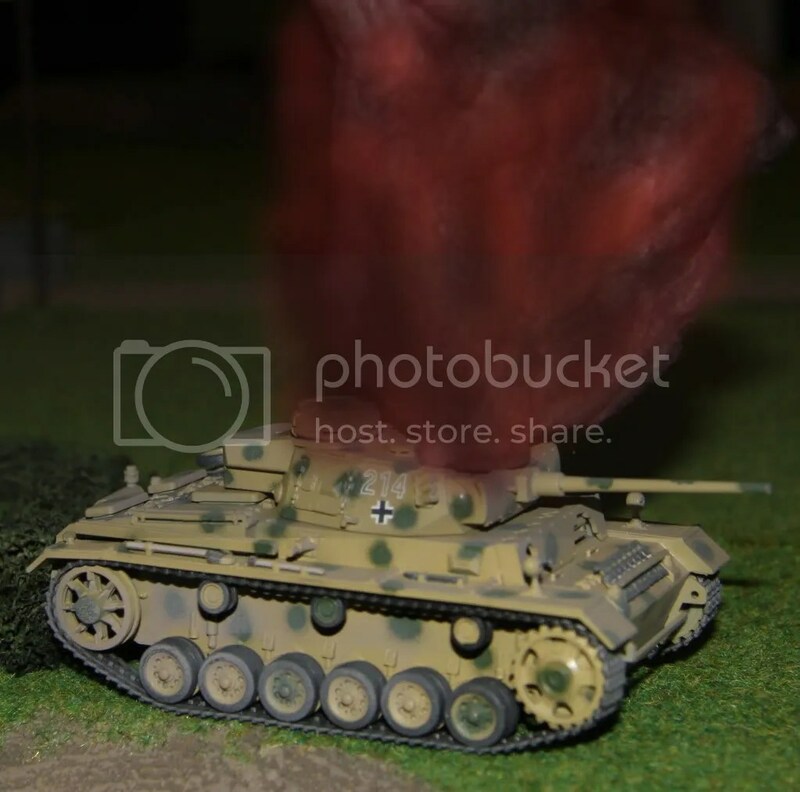 The shot from one of the Right hand PzKw IV´s hit it in the engine compartment, setting the tank alight and burning all the crew inside. Not a pleasant end! The other one (the one sliding down the bank in this shot) made it across and came up in a spot where it was virtually out of sight for all my tanks, except for one that could see its very rear. This put it into a prime position to make a short sprint the next round and be off the table. So my infantry took it on. They fired their HMG at its tracks and close assaulted it with hand grenades. I had only hoped to do a little damage and slow it down, but when the dust settled, it had thrown a track and was immobile. At the same time my advance PzKw IV inside the woods was in deep trouble. 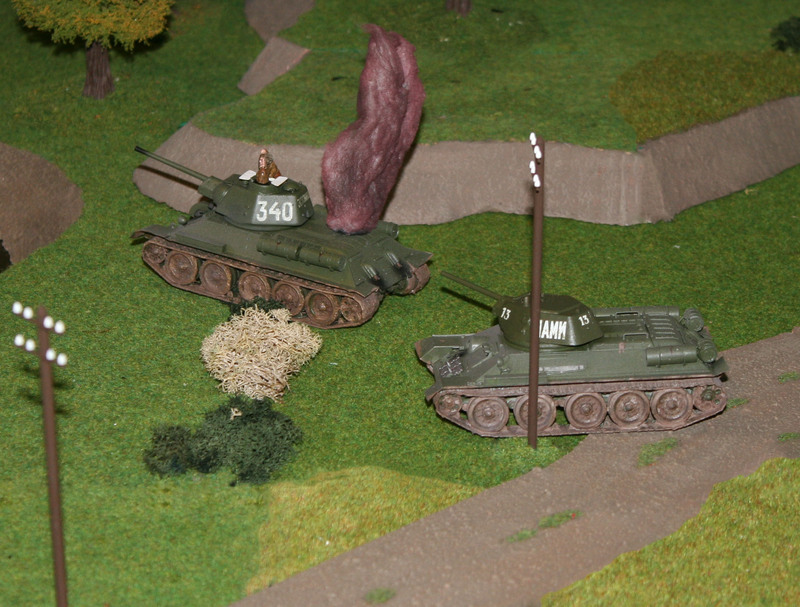 Two T-34´s had stopped just on the other side of the river and were taking aim at point-blank range. He managed to take one of them out before it could fire (again an ammo hit), but the second one (the one besides the telegraph pole) avenged it´s comrade. The shell hit my turret, destroying the main gun and killing everyone inside, except the driver. (It would later be taken out by the remaining SU-76 when trying to withdraw.) But there was not much time for the T-34 crew to celebrate. My left hand tank scored two hits on it and destroyed it for good. So in total things started to look better. The Soviets had only 3 T-34´s (one immobilized) and one SU-76 left to achieve their victory conditions. But it was not all bright either. The two remaining T-34´s had just crossed the river and would be able to move off the table by round 4 if nothing stopped them. Even worse… one of them hit my left hand PzKw IV setting off it large calibre ammo (we have never had near as many ammo hits in one game by the way). So that put me down to half my firepower. To finish things off for the second round the immobilized T-34 turned it´s turret and fired its co-ax LMG at my infantry, killing one of them. At the beginning of round three one of my remaining tanks decided that he wanted to give the infantry some breathing space. Even though the crew could only make out the rear of the enemy tank, it was easy enough to hit, being the sitting duck it was. Two shots hit true and wrecked the T-34. 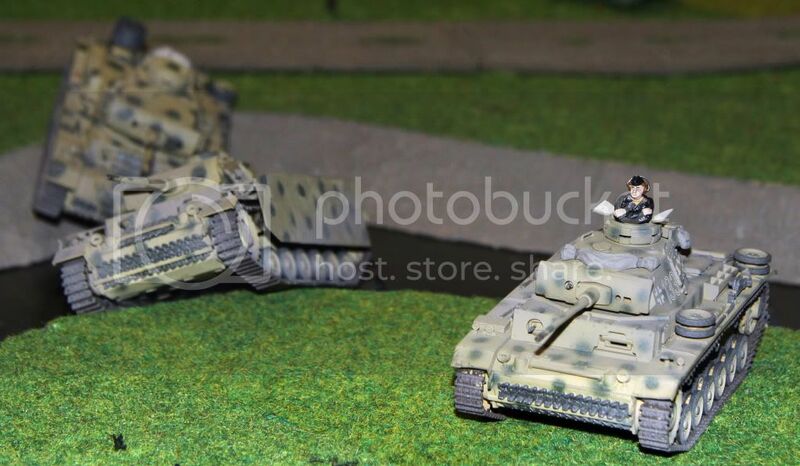 Since both the T-34´s that had made it across the river were now out of their line of sight due to one of the woods, my PzKw IV´s began to manoeuvre to get a better shot at them once they neared the board edge. And charge ahead they both did. But they were not meant to make it all the way. The first was hit in the flank by my infantry gun. It hit the external fuel tanks, spilling flaming liquid over the tank and setting it alight. The second one would only make it to it´s side before in turn being taken out by one of my tanks (another ammo hit). Now the Soviet player had no chance to achieve his victory conditions, but tried a suicidal charge with his last AFV (the SU-76) anyway. It did not even make it to the river. In the end none of the Soviet vehicles had survived and only three crew had made it out, only to be rounded up by the infantry. In turn I had lost four infantry, two tanks and seven crew. For some time now, we have been playing our way through the SkirmishCampaigns: Russia ´43 – Grossdeutschland at Kursk book. For those interested in how things went so far, you can find the results and game reports on our club homepage. Just click on the tabs above the text to browse through the previous games and so on. So what did this game have in store? It depicted events on Juli 7th with German armoured spearheads trying to push through the lines of the Soviet 3rd Mechanized Corps. There were three large hills on the table and a number of light woods. The table was cut in half by a small river which sported a single stone bridge of questionable stability. The Soviets were allowed to start in fixed positions. The infantry in trenches some of their tanks dug in. The Germans had to move onto the table at the start of the game. So what forces were pitted against one another. Well the Soviets had total of six T-34´s, three T-70´s and two KV-1´s (one crew would get serious problems with the commissar since their tank still sported a winter white-wash in Juli ;-)). They were supported by a nine men rifle squad which included a LMG and an eight men SMG squad. The Germans had four PzKw III, two PzKw IV and two PzKw VI “Tiger”. 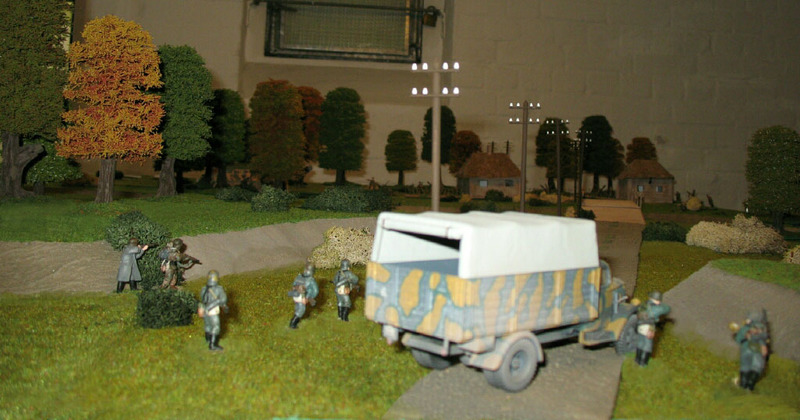 They also had a seven men Mechanized Infantry HQ Squad led by a LTD inside an SdKfz. 251/10 and a ten men Mechanized Infantry Squad inside a SdKfz. 251/1. 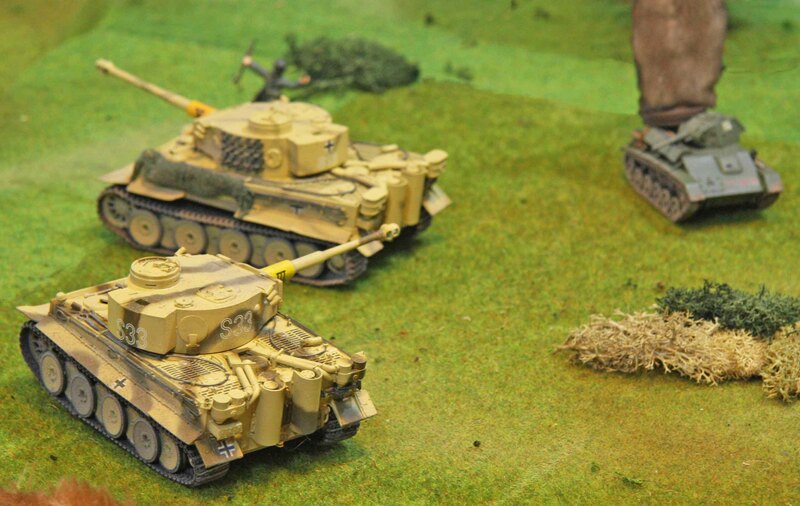 With the Tiger tanks this might seem like a walk in the park, but the scenario posed some bigger problems. Any tank the Soviets fielded, including the flimsy T-70´s, could easily punch through the armour of both the SdKfz. 251´s and the PzKw III´s, while the Panzer II´s could only hope for the same when catching the T-34´s from behind. 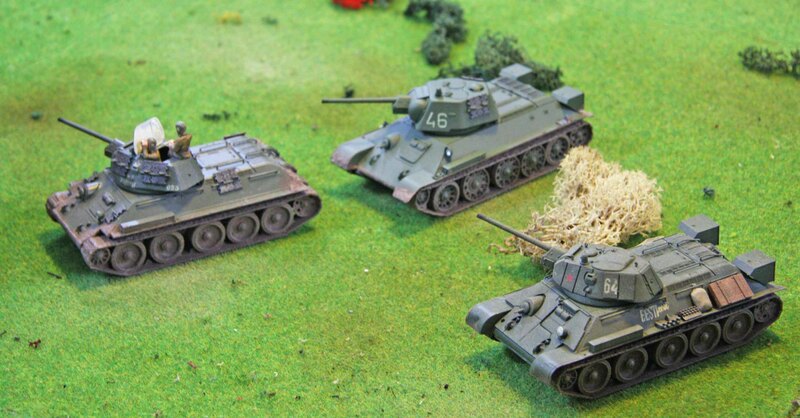 The T-34´s and Panzer IV were about an even match, but they were outnumbered 1:3. Obviously the Tiger were safe unless anything got around them, but even with their 8.8cm guns they could only crack the KV-1´s from the side or with a lucky hit from the front. All of this was made worse by minefields and barbed wire on the Soviet side of the river. So essentially the scenario was still a tough nut to crack for me playing the Germans. The soviets placed their three T-70´s and one of the T-34´s behind the hill on their side as a reserve. 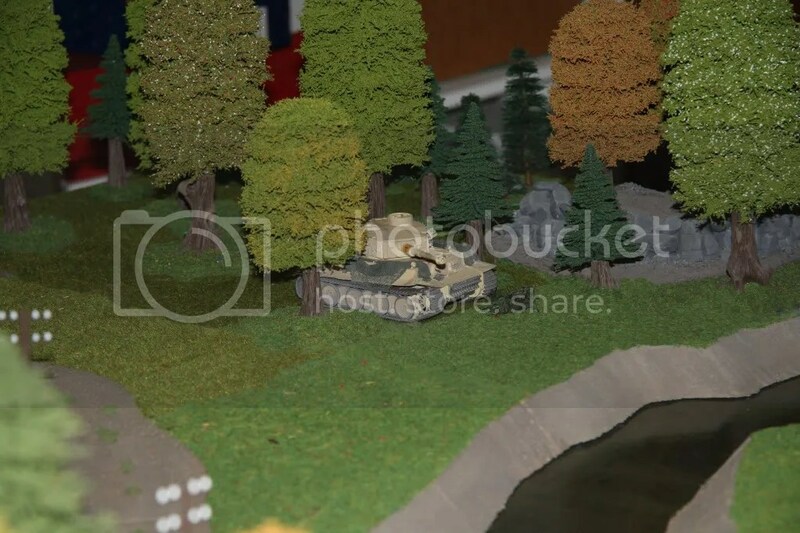 I decided to move both Tiger tanks forward and positioned them on my side of the river inside the treeline. This would make it hard for the Soviets to get behind them, while they could pick their targets without fear to be taken out due to their heavy armour. While the rest of my force charged ahead they began firing at the KV-1´s, but their shots only ever hit their frontal armour and never penetrated. By the time the remaining tanks had reached the river, the Tiger tanks had at least managed to shoot up two of the T-34´s. The PzKw II´s had split up. three rolled into the centre with the PzKw IV´s while one moved along the left flank to attack one of the T-34´s hiding there. Now one of the Panzer IV crossed the bridge, while the other forded the river. Or at least tried to, since it got stuck in the mud. The crew made the best out of the situation and fired from the resulting hull down position. Their first shot set the forward KV-1 on fire. Now that the majority of my troops was across the river the Soviet reserves moved forward. The counterattacking T-70s managed to take out one of the PzKw III´s, but that was about it. The other tanks outflanked the minefields or punched through the wire. they took out the Soviet armour with a fearsome speed now that they had cracked their lines and could catch them in their flanks and rear. Now the halftracks that had crossed the river in the wake of the tanks began to dismount their infantry to clear the Soviet trenches. The Soviets saw that their time had run out and surrendered. In the end the Germans managed to crack to soviet position for the loss of just a single PzKw III. So the Germans scored 29 Victory points vs. the Soviets 6.